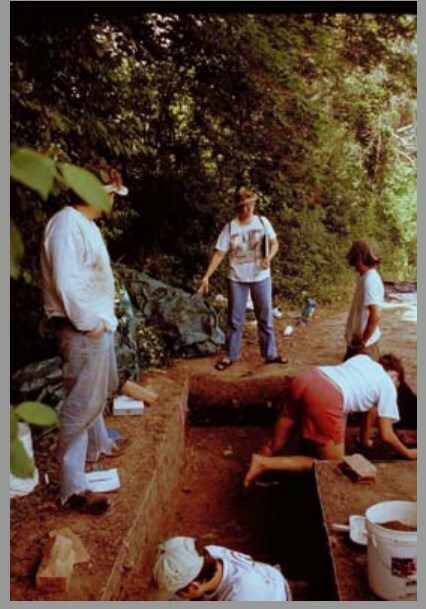 There are two sort of superheroes of archaeology that have been discussed when it comes to studying the early world of the Aegean Seas. Sir Arthur Evans and Heinrich Schliemann were both gentlemen scholars who for the most part broke new ground in the arena of archaeology. 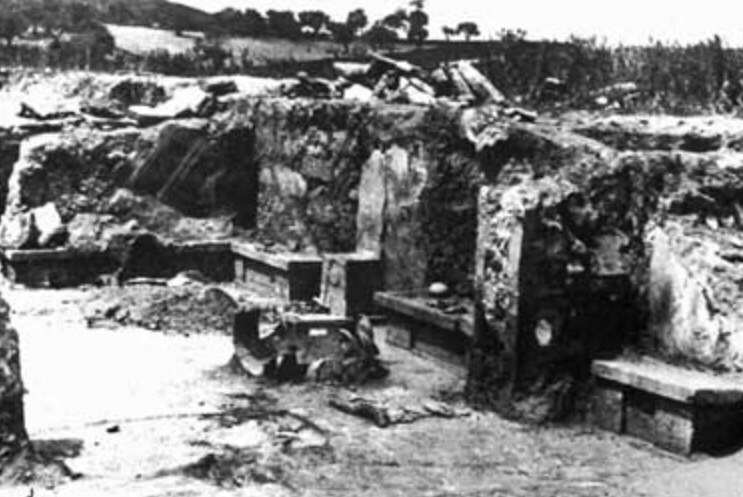 Mycenae was discovered before Knossos. Late in the 19th century Heinrich Schliemann used his personal money and whatever personal authority and power he had to begin excavations at Mycenae which was then under the control of the Turkish government. Schliemann is a kind of character who we see as both a robber as well as an innovator. In some ways he deserves a particularly grudging respect. Sir Arthur Evans could be seen in somewhat of a similar light. When archaeology first started to take off as a discipline most archaeologists and historians believed that the documents of Homer’s Iliad and Odyssey as well as the Bible, both the old and new Testaments, were somehow based in historical reality. In fact it was probably seen as part of the duty of an archaeologist to prove the veracity of these documents. We know that Schliemann who excavated the mainland might have misnamed both of the sites that looked at because he thought, believed, that these must be the places that he learned about in the Iliad and the Odyssey. It’s never been proven and there are no textual documents that would prove Heinrich Schliemann’s assertion that he discovered ancient cities that were discussed in Homer’s epic poems. However, it might be reasonable to believe that they are them. The wealth that Schliemann uncovered frankly inspired a whole new generation of Indiana Jones like treasure hunters. Arthur Evans however was definitely affiliated with the academic world of London as well as being a recognized scholar. 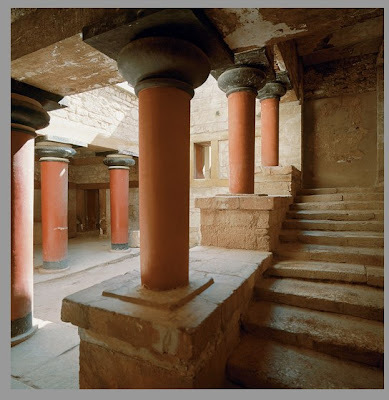 When he excavated the remains of the city of Knossos on Crete he did so in a more systematic manner than Schliemann did. 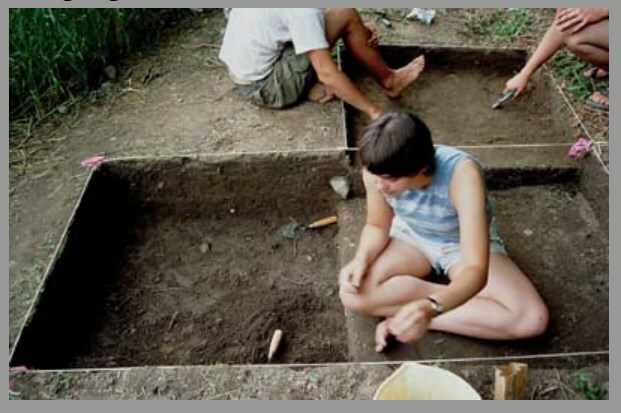 Nevertheless, both of these archaeologists destroyed an awful lot of archaeological evidence because they were archaeologist before stratigraphy was used. 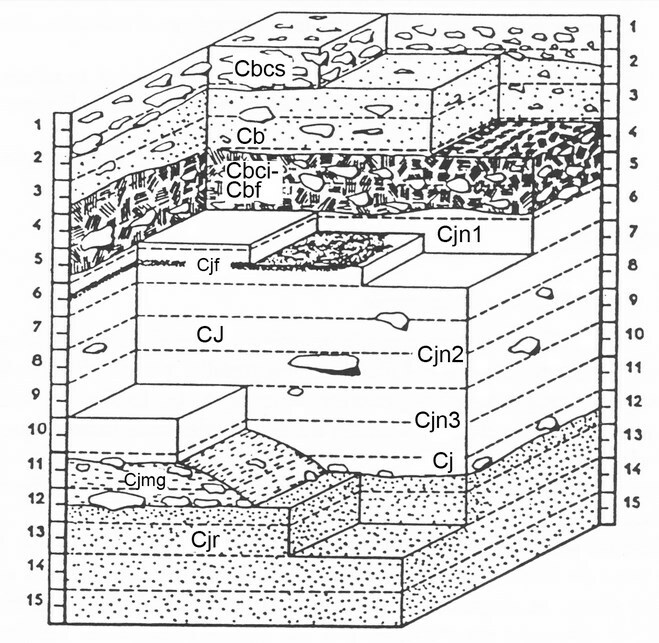 Stratigraphy is the practice of using a grid or Cartesian plane to organize the area that’s being excavated. 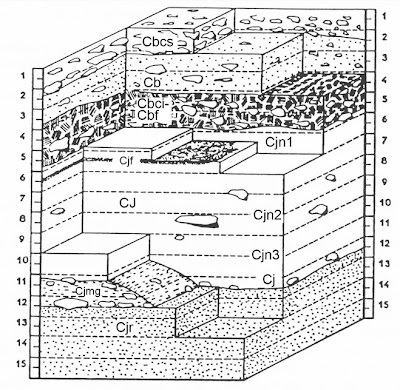 In stratigraphy the people who are excavating an area work in small sometimes as small as 1” x 1” areas that they pains takingly record what is found in each quadrant. In this way there is an almost digital recording of exactly what was found in each area. 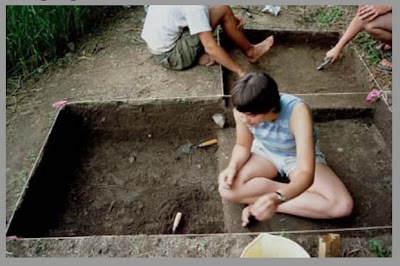 Evans and Schliemann excavated their sites by educated guesses as to where things were. They recorded all of their observations in notebooks as well as drawing in the notebooks. They did take some photographs but today’s archaeology is much more organized and preserves much more of the data that was found he sites. 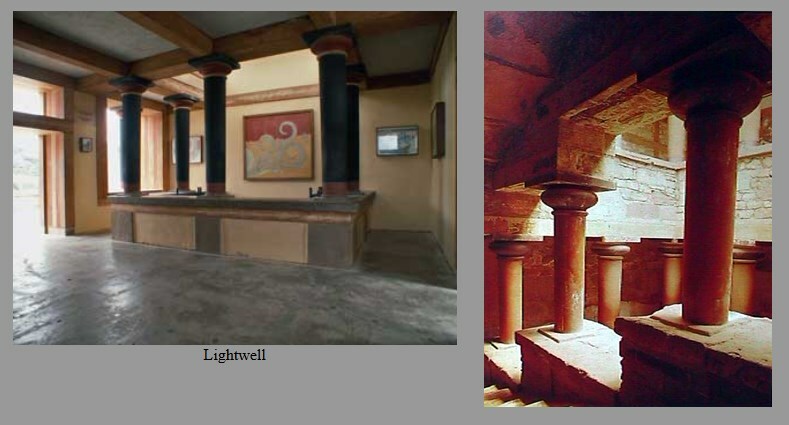 One of the other things that Schliemann, and Evans and sometimes other architects and archaeologists did was to reconstruct the things that they found in their original locations. There are some question as to how accurate some of these restorations are. Crete is an island near the Cycladic islands and is a perfect port and stop off place for any ships or in the case of this world, boats that would be sailing through that region. In fact most sailors didn’t sail farther than the land they could see and one of the nice things about the Aegean Sea is that it started with a series of islands so that a nervous sailor could keep places insight for a large part of his journey. The island of Crete is probably a very rich place mainly because of where it was located as a sort of stop off point for water travel. It also had an excellent climate that allowed for the growing of grain and olive oil and olives. Small livestock and they even had supersized bull that had a hoof print that was the size of the human head. These bulls have long been extinct. 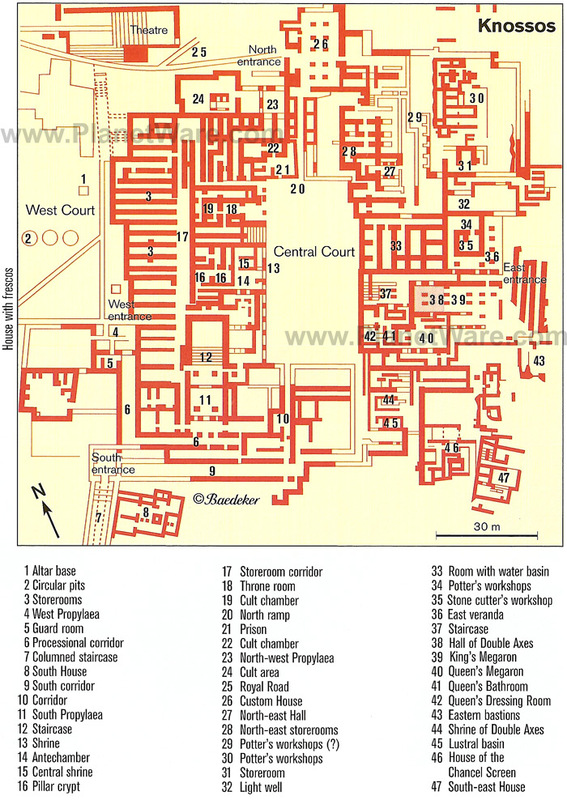 The site of the city of Knossos is located in what we might think of as an un-defensible or at least had no defensive walls around it. Scholars have suggested that Knossos had a Navy that was very powerful in the period between 2000 BCE to about 1450 BCE. 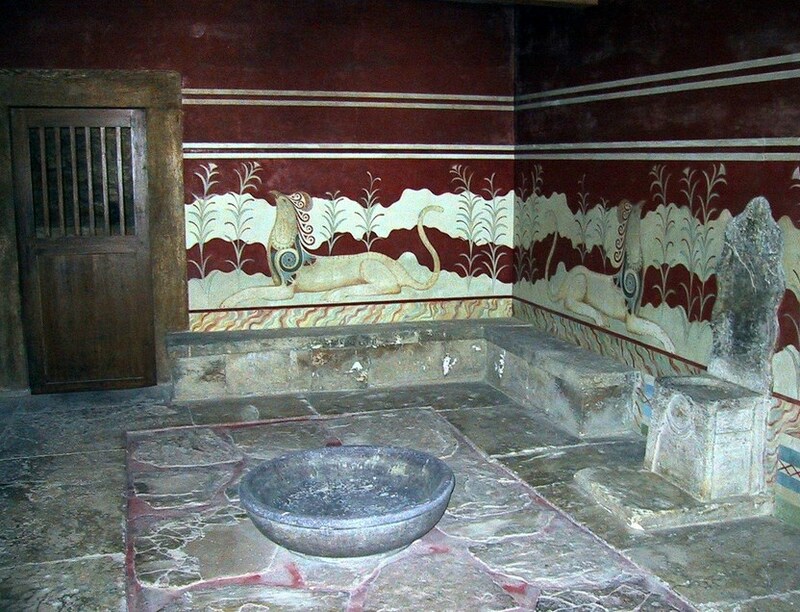 It may be some of the reasons why there are myths associated with the Minoan culture. Most scholars teach Knossos as a culture that lasted for several thousand years and was considered for a long period to be Neolithic or prehistoric however we now have records into languages called linear a and linear b. It does seem however that the later language of linear b is an import from the Mycenaean culture and may be an indication that sometime around 1450 BCE the Minoan culture was taken over by the Mycenaean culture invaded. Other evidence that seems to support this were a series of fires as well as natural disasters that preceded the date in which the tablets come from. There are many theories but no clear evidence as to what happened after 1450 and why Minoan culture shifted so radically at that time. 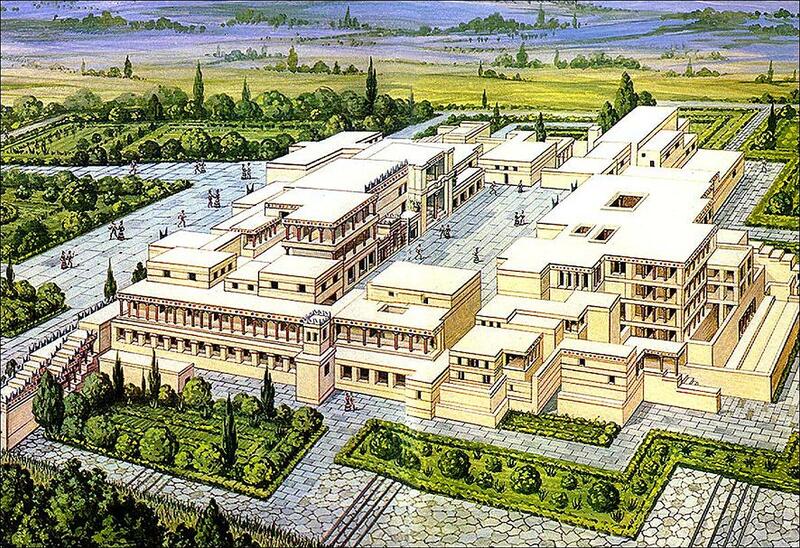 The palace at Knossos is a large sprawling complex. It covers several football fields or more of land. It is multilevel with a series of air shafts and staircases that run throughout it. And there are also large areas that would be used for storage of things like olives, olive oil, grain, and other types of cheeses and cured meats. 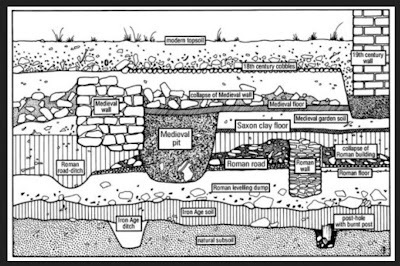 Some of these areas are actually places where a hole is dug in the ground and large 5 to 6 foot tall vessels are placed below ground almost as if it’s a natural refrigerator. Many of these vessels or the majority of them were made out of terra-cotta clay. The majority seem to run the height between 1 foot to 3 feet tall and most are ornamented and some would’ve been painted. 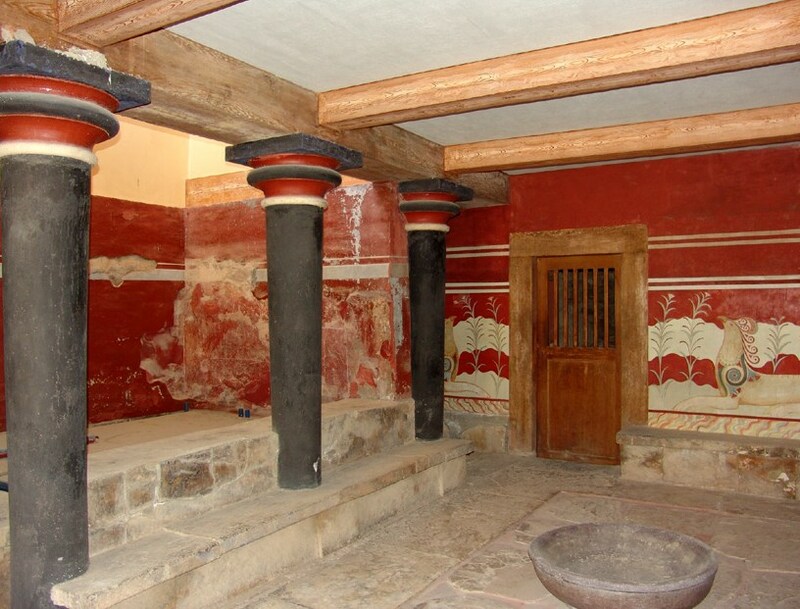 The technology used to build the architecture at Knossos is a combination of masonry which is laid in rows called ashlars which are alternating courses of brick, and then they would’ve been covered over with plaster would’ve been painted in a style called fresco. Some of these walls have several layers of frescoes on them. The staircases and air shafts are composed of masonry and at the time wooden columns. These columns seem to be replacements that were installed by Arthur Evans and made out of some sort of concrete or stone. The coloring you see here is also largely a restoration. The colors were based on scraps and fragments of color found on the remains of some of the columns and walls. The architectures post and lintel since it uses the column as the post and then it has stone lintels across that. 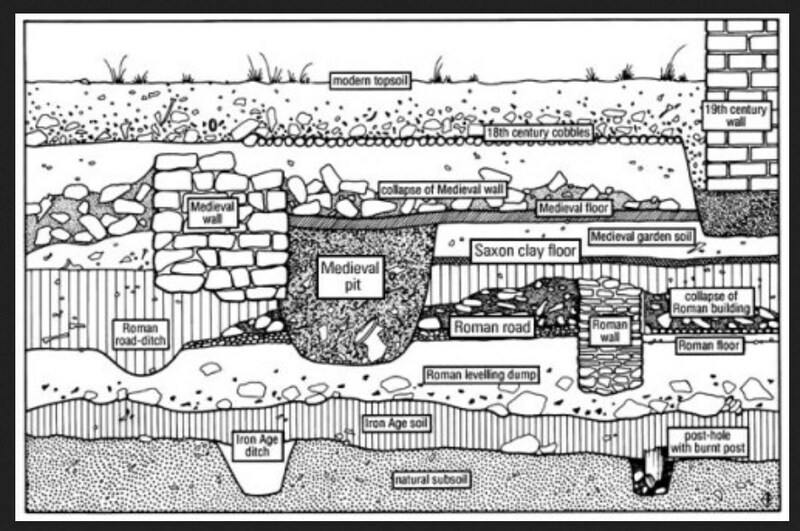 It’s the most basic form of architecture and was used in ancient Greece and ancient Egypt. 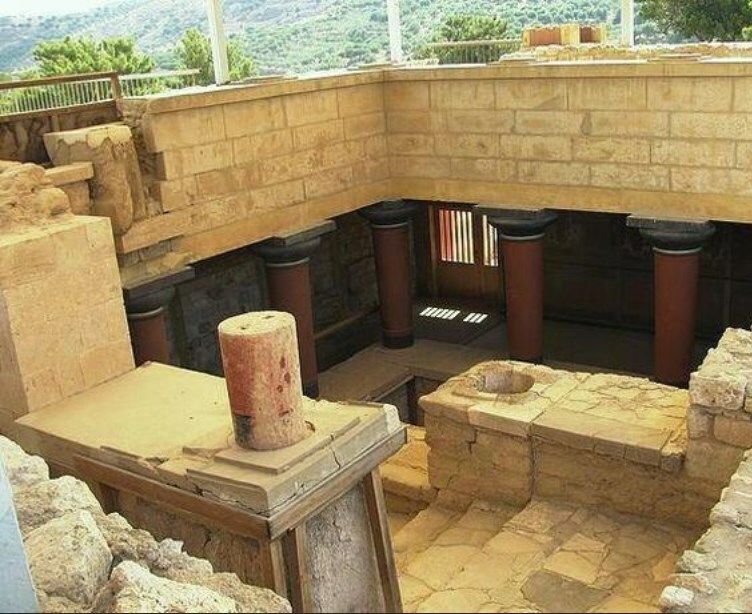 There are many theories addressing the mysteries at Knossos the first one being was it a temple or was it a complex were people lived or was it a big granary or ceremonial center. It actually appears for most of the factual data that it was a combination of most of these at several points in its history. 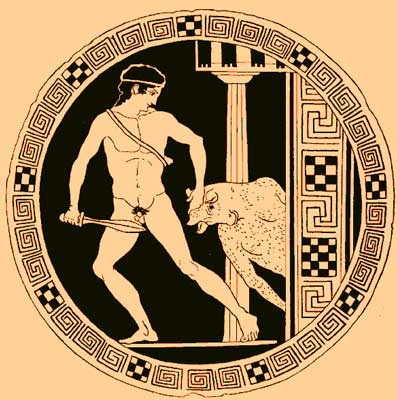 Much of the interpretation and formulation of histories concerning the Minoan culture and the place known as Knossos is based in a series of myths and’s earning the ancient King Minos, the legend of the labyrinth, and the legend of the Minotaur. So in order to understand the complex and what it may symbolize it’s important to have the bones of the story. The legendary or mythological history of Knossos begins with an ancient King named Minos who according to myth committed an act of hubris. The King who felt he was so favored by the gods asked the God Poseidon were a gift to show his favor. Poseidon provided out of the waters a beautiful white bull. It’s implied in the myth that in order for the King to show his gratitude to Poseidon he should have sacrificed the white bull. Instead the King sacrificed another bull. To pay back this act of disrespect, also called hubris, Poseidon put a curse on the King and his wife. The Queen was enchanted and suffered from a terrible lust for the bull. Through an actor subterfuge Queen was able to mate with the bull and the offspring that resulted was a bullheaded creature that had the body of a man. The mist in the story are much more complex than this but the end result is that the bull was placed in the center of a labyrinth that was designed by a prototypical inventor called Daedalus. The maze or labyrinth was thought to be unsolvable. Years later the Athenians would been defeated by the Minoans were expected to pay tribute, this is very similar to the story of the Hunger Games, in which several Athenian noble born males and females were teenagers or children were expected to be sent to Knossos as payment of attribute. The children were placed in the maze, from which they could not escape, and would die. 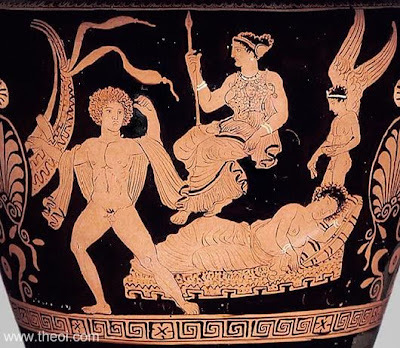 A legendary King who was a prince at the time, Theseus traveled to Crete and was given a ball of twine and a sword by King Minos’ daughter Ariadne. She had fallen in love with Theseus on sight. 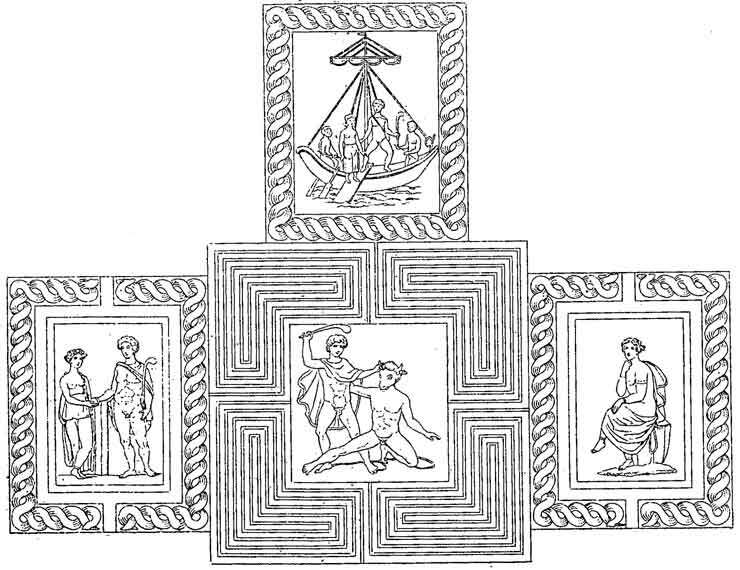 The results of which Theseus use the ball of twine to find his way out of the maze once he had slain the Minotaur with the sword Ariadne gave him. Ariadne and Theseus flee. When Theseus returns home to Athens he has forgotten a key signal that he was to send his father the king, he sailed under black sails back into the bay and he was supposed to sail under white sails if he was successful. 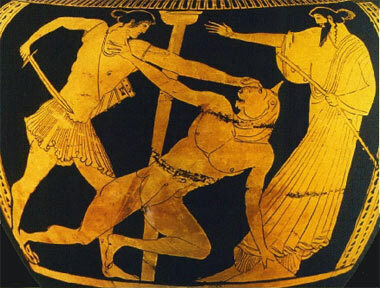 The result of Theseus’s error is that the King committed suicide and in forfeiting his life Theseus became the new king of Athens. There’s a really bad movie about this with the same guy who played Superman. The myths above may have been stories told by the Athenians in response to a very ancient grudge that they held against the people from Crete. We only have the Greeks account of this and it may have even been some of the justification for the Mycenaean invasion of the island Crete somewhere around 1450 BCE. The myths may also explain or at least be related to some of the artwork and the overall design of the palace which from the air looks like a maze. There are other objects inside that may account for this. One other clue of the link between the mainland of Mycenae and Crete is the shape of the columns which seems to be narrow at the bottom and widen at the top. 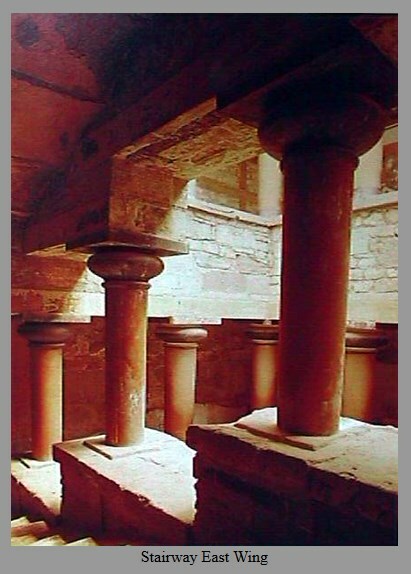 The capital on the columns is also very much like the "echinus" on a Greek column from the Doric order. This this area was reconstructed by Evans and is the site of where one of the first frescoes that were fairly intact to be found. The story goes that one of Evans assistance was digging in a passageway of this structure, which was collapsed, and while in a tunnel this fresco of a bull apparently startled the excavator. What we see here is a reconstruction of the original fresco. Complete with colors that may or may not be accurate. The colors were based on fragments of colors found throughout Knossos and I haven’t been able to find any data that shows any scraps of red paint left on the original Bullhead the way it was found. This is how the bull’s head looked when it was found. The original is now in a Museum and Crete and a facsimile copy is there in the ruins now in where they think the original spot was. This bull’s head is probably life-size for the type of bulls that were on the island. It is fairly naturalistic. The anatomy of the bull makes sense and is not overly stylized in any other way. Perhaps the coloring is stylized. Although this is called fresco it has elements of relief sculpture. This sometimes is the case with fresco painting. Since fresco is done in daily sections and is actually a coat of plaster that supplied first sometimes, even in the frescoes of Giotto who will study later, the artist incorporated an element of relief. The element of relief here is both high and low relief. For example the head as a shape is in fairly high relief as are the horns and the eyes. Other elements, such as the nostrils and mouth and texture of the horn are in low relief and some of the lines or even incised. Since this is made out of plaster it probably is a combination of both additive and subtractive sculpture. Additive and subtractive sculpture is when you add stuff like plaster to build up the surface. However after the plaster is dry the artist may have gone and with a sharp tool and carved away some of the details into the soft plaster before it was painted. This bulls headed fresco is probably painted in a style called “secco fresco”. 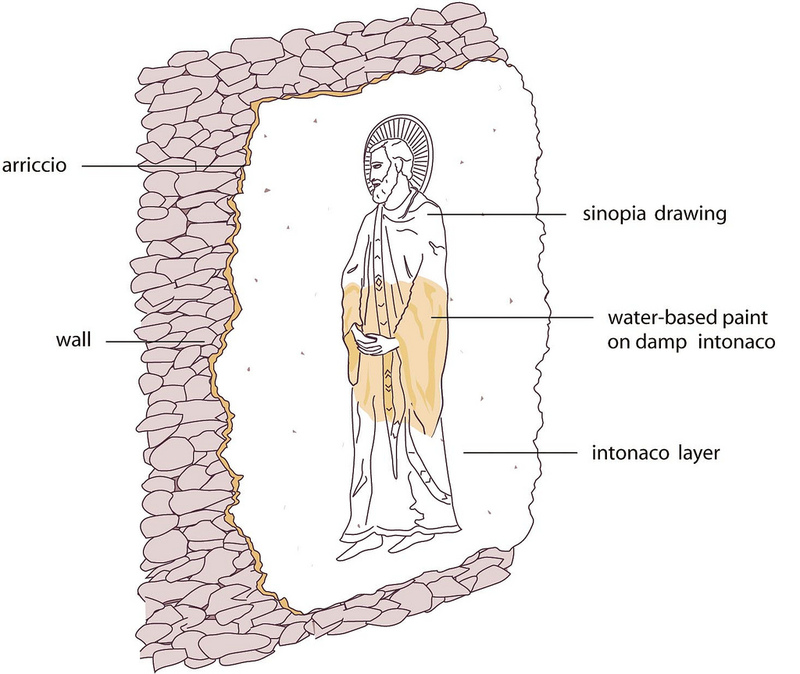 (dry fresco) meaning that the plaster had already dried before the paint was applied. 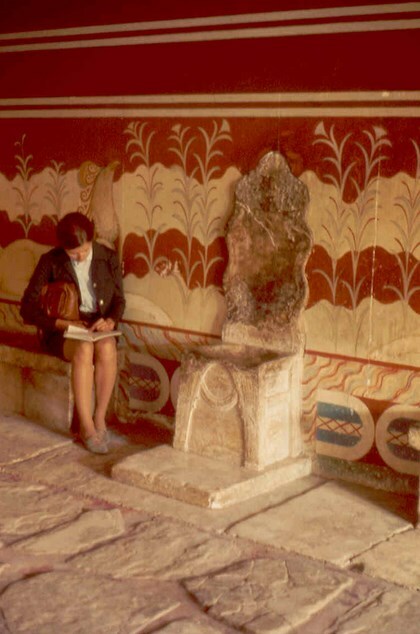 We will discuss the process of fresco using another mural from Knossos later. The icon of the bull is fairly dominant all over the Minoan culture. 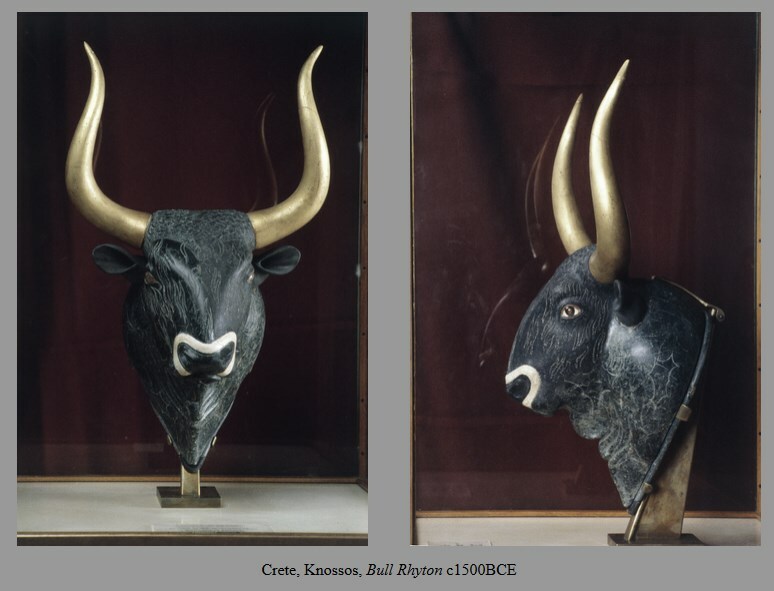 We even see instances of images of bulls at Mycenae and other mainland sites. We’ve also seen bulls referenced in prehistoric art in both European and Mesopotamian settings. The universal theory concerning bulls and what they symbolize seems to be that bulls are large powerful creature and that by controlling them either in representation of bulls or in real life that it means something about the power of the individual who is doing it. 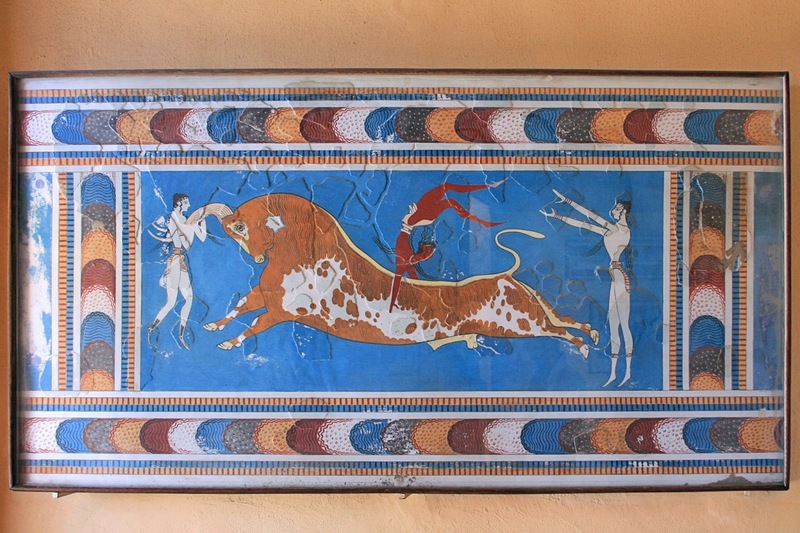 In Knossos in particular there are many references to an activity called bull jumping or bull vaulting. There are both frescoes and sculptural items that depict people leaping in front of a bull grasping their horns and tumbling over their backs. Considering the size of the bulls in Knossos this would’ve been quite an accomplishment and could represent athletic prowess or even the favor of the gods. The naming of various rooms by Sir Arthur Evans is highly suspicious. For example, one source claims that the King’s throne room was originally named by Evans as the Queen’s throne room or megaron because the throne or seed in it had a very large indentation and he explained that women were more amply endowed than men and therefore this must be a female seat. I suspect that’s a bit sexist I don’t know that just could be me. In the case of this room, although I haven’t found any sources to support this, are several frescoes that depict dolphins, flowers, and wavelike forms. There is also a series of benches along the walls. Most likely, Evans made a decision based on his perception of the images used in this room to dub it the Queen’s megaron. There is no factual data to support his theory. In order to understand the decorations in this room you must first understand the process of how mural painting was done in the ancient world. This process, called fresco, is still used today and was used in almost every civilization since that time. 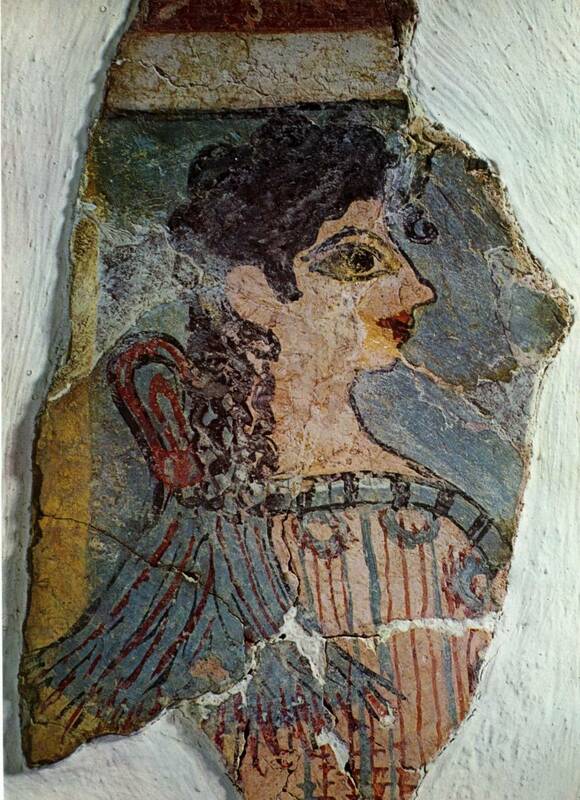 The Egyptians did have a form of fresco, however, it was a dry form of fresco called fresco secco. What this means is, they would apply plaster to the walls of tombs and other structures, wait for it to dry, and then paint on the walls with a combination of eggs and mineral pigments. This is called egg tempera painting and it is the secco coat of fresco. Buon fresco literally translates from Italian to mean good fresh. It is a different process than fresco secco. First a rough coat of plaster is applied to the walls and the daily sections are drawn either in a brown paint or and charcoal on the walls. A second thinner coat, about 2 to 6 cm thick, is applied small daily portions called in Italian giornate, which means in Italian day’s work. While that daily section of plaster is still damp the artist mixes a combination of minerals that are pigments, such as yellow and red ocher, and mix it with mineral lime and water quickly applying this to the wall the paint soak sin sometimes up to several centimeters depth. This means that the painting is very sturdy. If the artist for get something they can always it using the secco method. You can see that these frescoes for the most part have been restored and you can see the layering of different areas of fresco that go deeper and deeper into the wall. This is because as the temple shifted and conditions in the temple such as earthquakes shook the plaster off the wall new plaster was applied and new designs applied on top of that. 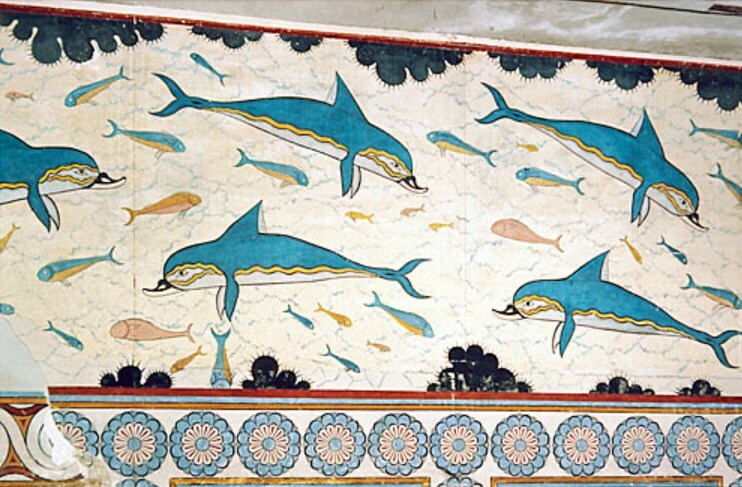 This particular fresco is one of the more famous ones from Knossos and represents a variety of things that have to do with the sea. All of the themes on it are classified as a aquatic or maritime although in this instance aquatic is probably the best adjective. The border on the bottom depicts a wavelike form in the older layer of fresco. You will see this pattern in many cultures and it usually represents water in some ways because it is a series of counterbalancing curves and circles. The circular pattern that the first wavelike design at the bottom of the picture establishes also establishes the size and placement of the flowers that were painted later on at the same time that the dolphins were painted. The flowers are in idealized and geometrically stylized design. In general neither the way forms nor the flower forms could be described as naturalistic since they are so heavily stylized. This includes the dark outlines and the colors that are very saturated. Above this border is a scene that describes dolphins and fish swimming and at the edges are a series of botanical possibly water plants. All of the fish are depicted in profile view, which is probably the most identifiable view of the fish, and the size and scale of the dolphins to the smaller fish is naturalistic. The size of the dolphins is probably 3 to 5 feet long., which makes them just under life-size. The colors of intense blue that the dolphins are painted is not naturalistic. Neither are the outlines and stylized counterbalancing curves used to describe the division between the pigmentation. One of the terms that’s often used to describe the art of Knossos is a contour line that has counterbalancing curves, which means that for every curve going one direction often there is a wavelike opposite curve accompanying it.. This will relate to an artistic movement that happens in the early 20th century called Art Nouveau. Dolphins and other fish were a common part of the life of most people lived in and around the island of Crete and in the Cycladic’s. In fact, dolphins often accompany ships, porpoises do the same, and there are stories of a type of symbiotic relationship or friendship between sailors and dolphins. There are even stories and myths concerning dolphins saving sailors who ships have been lost. Unfortunately, I’ve also read some stories about schools of porpoises and dolphins beating swimmers to death with their noses. Some suggesting don’t jump into the water until you know if the dolphins friendly. Dolphins and porpoises also are known to attack sharks and beat them to death in the same way. In this instance this may be the only thing we need to know about the iconographic analysis, however, there is a Greek myth that may relate to this since the Minoans and the Greeks are so closely related. 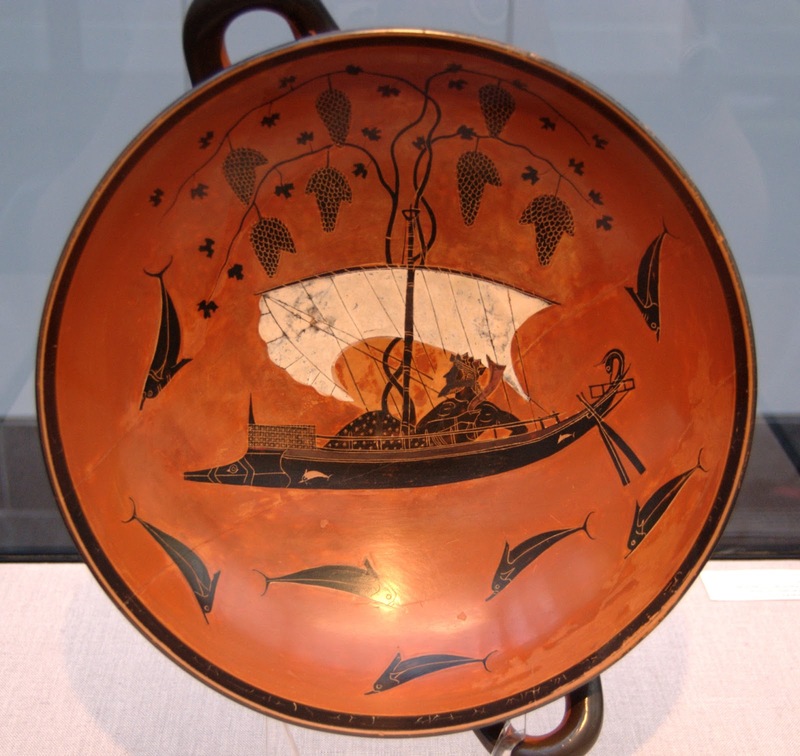 This kylix by an artist named Exekius portrays the following myth and relates to the fresco. The Greek God Dionysus, who is the God of wine and drama, was on his way home from Persia when he hitched a ride him sailors who promised him they were going to his home city of Thebes ancient Greece. 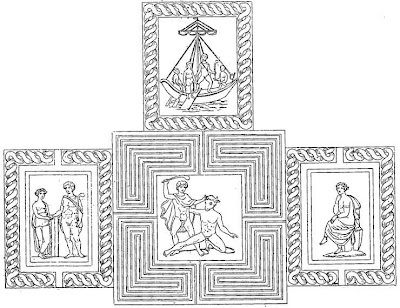 When Dionysus discovered that the sailors were not going to deliver him to his destination he punish the sailors by making grape arbors, Panthers, snakes and other creatures spring from the deck of the ship. The sailors were so freaked out by all this that they dove overboard. As the sailors began to drown they prayed to the God Poseidon to help them. Poseidon sent dolphins to save them. Perhaps, this myth in some ways, relates to the fresco we see at Knossos. The black and white image is the original condition that the so-called King’s throne room was in when Evans found it. The photo of the original condition of the throne room gives us a pretty good idea of the extent of Evans reconstruction and conjecture concerning how the rooms would have looked. The frescoes might be pretty accurate in this case because they were composed of found fragments put together like a jigsaw puzzle. The walls are covered with a series of fresco paintings that have been reconstituted from the fragments. The fragments depicted a composite creature made from a feline or lion like creature with the head of some sort of predatory bird. The forms of both the animal and the landscape behind it are composed of hard edged contour lions that define colored planes. Diagrammatic schematically drawn plants. And the creature, called the Griffin, is constructed in a very stylized way. Geometric curvilinear designs are used to portray the feathers fur and structure of the animal. There is an additional stylized design on the shoulders of the Griffin in blue and red. Beneath the Griffin is a painted design that simulates marble. This kind of painted simulation is called faux finish or trompe l'oeil, (French to fool the eye.) Faux Finish means “fake finish in French.) Fancy huh? The throne is embedded in the wall but is a freestanding stone chair that has a shallow but shaped contour. The designs around the throne have a combination of curvilinear forms on the back of the chair as is the overall contour of the back of the chair embellished with the counterbalanced edge. The base of the chair is carved to simulate a chair that would’ve been carved out of wood and has a series of geometric triangular shapes and circular forms. It’s very easy to see how Evans drew the conclusion that this is a type of throne room or meeting room for important people. Part of this is the placement of a chair in the center of it that is distinguished from the rest of the benches that surround it. It’s almost like the rest of the benches are focused on the chair. This type of symmetry is also used in painting and you can also see it in Christian artwork where important figures are depicted in the center of the picture plane. The chair is also larger and taller than the benches that surround it. However, Evans first interpretation was that the chair was made for a female because of the size of the indentation designed for the kind corners. Other things seem to support the fact that this was an important gathering space perhaps even a ritual space. The large bowl, which could’ve just been a fishbowl, is a fairly permanent item and if Evans is placement of it is correct it might’ve been used for some sort of ritual purpose since it was in the center of the room. Other things that iconographically support the contention that this is a type of throne room are the fact that the animals are focused symmetrically around the chair and facing it. And these animals, called Griffin, share qualities in terms of the there composition with other creatures associated with royalty. For example, liens and eagles are associated with power, aristocracy and nobility in Asia minor and also in Egypt. 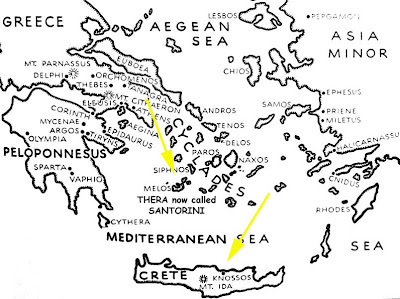 Both places the Minoan had trade with. Another formal element that seems to support the iconography of this being a throne room is the heavy decoration of the walls throne and other surfaces. Also, the air shaft, sort of like having the corner office in an office building, provides an awful lot of light and air and these are often granted to people who are more important than the general population. This is called the Parisian because when the archeologist who first saw it exclaimed, in French of course, “She looks like she came from Paris!” Perhaps this story is really the main reason why it’s in all the history books. Possibly the fact that she looks so contemporary relates more to our relationship to the image than to the value of what it represents.For example, the manner in which this women is portrayed, this type of stylization is very much in tune with how the artists and even actresses appeared in the 1920’s and 1930’s. This is a fragment of a larger fresco that was found in its original location. The amount of color that has survived attests to the strength of the medium. The colors are still vibrant. The stylization of the face is consistent with Egyptian faces. For example the eye is a frontal eye that is heavily outlined. The lips are colored as if they have bright make up on them. Very much like a 20th century flapper. There are some elements that are consistent with later Greek art from the mainland and also relate somewhat to how the Mycenaean’s represented the human face. For example, the way that the nose is represented is a stylization that will see in later Greek art such as in this stele. Other elements of form that seems significant are the use of contour lines to outline forms. 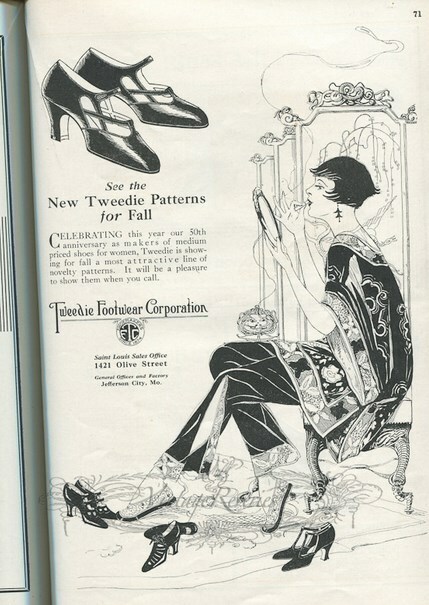 We get a sense of the hairstyles and costumes for women from this as a primary document. The makeup, clothing and hairstyle for female figures seems to be consistent throughout the Palace for women. Some of these traits are shared by representations of male figures as well. 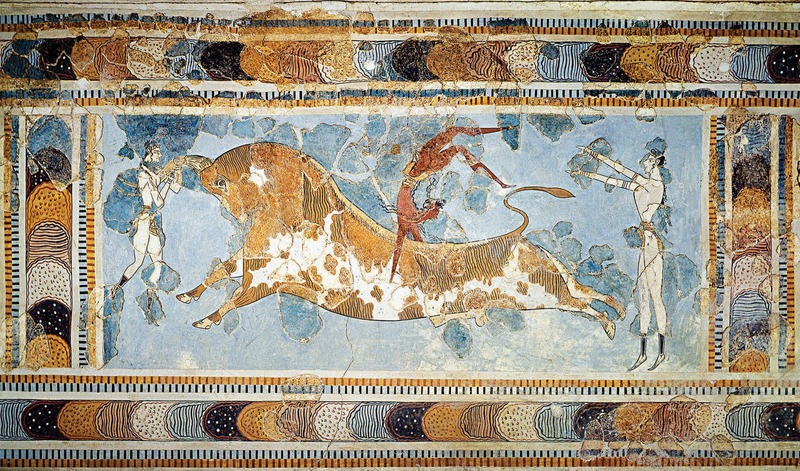 “The Bull Jumping Fresco” is the most famous fresco from Knossos and has been the subject of very much speculation. People are fascinated with the subject matter and they’re not sure what to make of what’s going on in the scene. Even today there are some insane individuals, just go to YouTube and type in all vaulting, that actually do what is portrayed here. They run towards a bull, sometimes grabbing the horns, vault onto the back of the bull, and then land behind it on their feet. Remember that the bulls of Knossos were around 7 feet tall and the people on average were 6 feet tall. In the rest of the world the average height for most people was between four and 5 feet. Visitors to Knossos must have talked about this in other places. Maybe the stories of the Mycenaean’s discussing what they thought was the history of the people from Knossos before they got there is how the tales of the Minotaur and Theseus began. There certainly both a lot of bulls at Knossos and references to bulls and cows in Greek mythology that describes the Minoans. Maybe this is just a bunch of fantasies that people of made up about people they didn’t know. It’s probably the safest way to analyze the iconography to throw away or disregard the mythology and stories from later cultures and start by actually looking directly at the object and what it portrays. What we know for certain is that there is a figure on the far left who has pale skin was grasping the horns of the bull. On the back of the bull is a darker figure who appears to be doing a handstand on the back of the bull or tumbling towards the figure at the back. The figure behind the bull has both of its arms raised and the arms are pointed in the direction of the tumbling figure. The scene above could be interpreted in many ways. One interpretation which is popular is that the figures on either are spotters. (“Spotters” are people who were there to catch the athlete if the athlete falls off the back.) Another interpretation is that this is several people running at the same bull and in various stages of vaulting off the back of the bull. It also could be a combination of the two above. The interpretation of the scene, the skin color, the gender, and even the story is not conclusive, however, we do know that the same scene is repeated in other forms of art and artifacts. So we do have some confirmation that the Minoans had either a sport or a ritual in which people would vault onto and off the backs of bulls. The Spanish have “Bull Fighting” and the Americans have Rodeos. Possible interpretations of the “Bull Vaulting” art are that these are sports heroes, entertainers, or people performing a ritual. We still do not know what ritual and who it was performed in honor of. In general all of the art that is two-dimensional from Knossos shares the following qualities. Shapes and forms are defined by outlines. The drawing style looks very familiar to us and could even be closely related to some contemporary cartoon styles. There is no depth or layering of the picture plane except for occasionally there will be animals or people in the foreground with plants in the background. However there is no middle ground. There is no shading of the figures. There is no value structure and shadowing is not part of the vocabulary that they used to render the world around them. The forms are always stylized and are not necessarily gender specific in terms of the stylization. For example the male and female figures are surprisingly similar in the line quality which is curvilinear lines. Border elements and architecture are often defined with squared off forms. In the case of animals and supernatural creatures, for example the bull in the Bull Jumping Fresco, have patterns that are regular and often based on geometric forms in place of hair like an featherlike textures. The ringlets and hair often are very exaggerated. This tiny vase was found not in the city of Knossos but rather in a place called Hagia Triada which is another Minoans city. It has a couple of things that we really find important from both a stylistic as well as a historical point of view that link it to two other geographic regions. The material used to carve this little vase is called steatite. This type of stone is not found in Crete and according to two sources I found it is only found nearer Egypt. One of the sources suggested that the material was exported from Egypt to the island of Crete and was used by artists there. So the main idea behind this is that this was made out of and imported material and furthermore and imported raw material. This would indicate some sort of trade routes going back and forth in this region and this would be consistent with what the archaeological record suggests. Another link to a geographic area that is not the island of Crete is the stylization of the figures in this. The stylization of the figures is similar to some of the stylizations that we’ve seen in Mesopotamia and in Egypt. This is somewhat of a formal element. We’ll see one more link in the musical instrument that the figure in the foreground is holding. The figures in this vase all have thin waists and wide shoulders. The body type is an idealized male body type that is similar in its anatomy and proportion to Egypt as well as Mesopotamia and later on the archaic period in Greece. Other similarities to these Mesopotamian and Egyptian examples are that they all are relief carvings. Since steatite is a stone this vessel was actually carved rather than made additively with clay. They all have a similar sense of space and that they create shallow space and the only way that they do create space is through a minor layering of things like figures or plants. 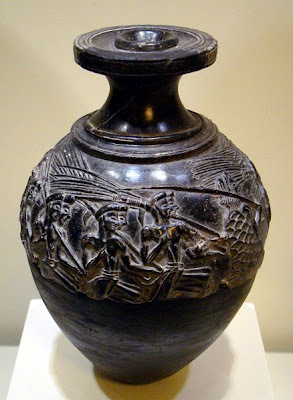 Unlike the victory palette of King Narmer or the victory palette of King Naram Sin, the scene on this vase is almost a scene of everyday life similar to the scenes that we saw of Akhenaton’s family and the fowling scene Tomb of Nebamun. This is called a “genre scene” and will come up later in other periods of art history. A genre scene is not necessarily a religious scene but a scene of everyday people doing something that is recognizable but still every day in a way. Some examples of genre scenes are mothers and children parents and children, hunting scenes, and scenes of the harvest. In this case, we have a harvesting scene. The sistrum is a musical instrument found in Mesopotamia, Egypt and Crete. I looked into it and representations of the sistrum in Egypt appear to predate the sistrum’s existence in Crete. The sistrum in Egypt was often used in celebrations and sometimes used in Egypt as a symbol of celebration. These sistrums were found on the Island of Crete. I couldn’t find their date. 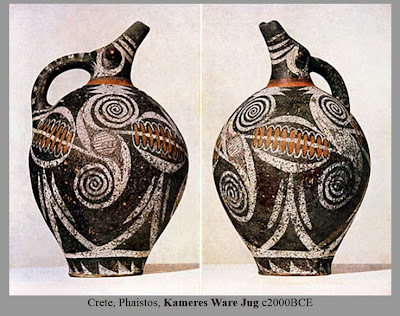 You will see the tem “Kamares” and “Kamares Ware” linked to Minoan Vases made between 2000 BCE and 1500 BCE sources say 1450 BCE. Kamares is a village on the island of Crete and also the source of the pottery. 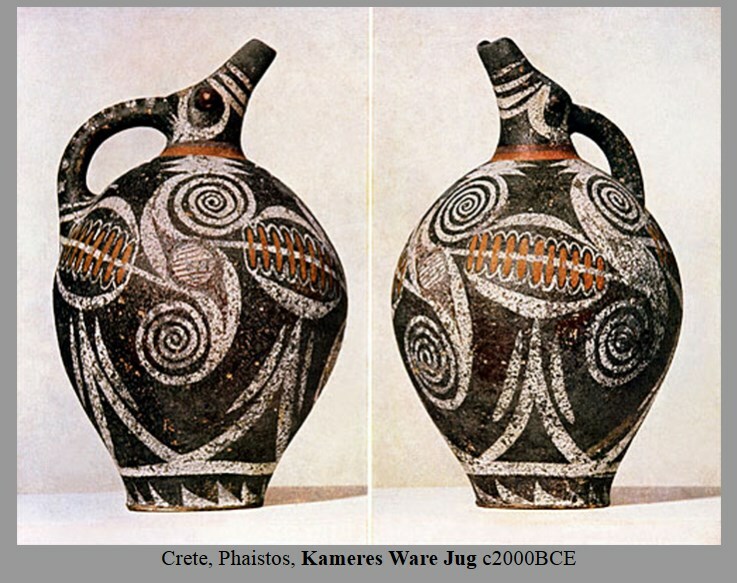 Apparently Kamares Ware was a highly prized form of pottery from ancient Greece and the elite Minoans collected it. One of the first discoveries of Kamares Ware was actually by Flinders Petrie and Egyptian archaeologist who found several pot fragments during one of his excavations of in Egypt. The quality of the spinning and thinness of the pottery is part of why it was prized so was the decoration. The designs of these vases are distinctive because they tend to look more abstract and some of the other vases. For example in this vase seen from two points of view is clearly designed in several bands. The top of the vase has a red band that divides the scene in the central part of the vase which is the largest and that scene is divided off from the bottom part of the vase with another horizontal band in white. The various areas of the vase are adorned with a series of white glazes that while abstract just organic forms using both horizontal band this and circles. It is unclear what it represents. The middle section of the vase is dominated by a series of repeating forms one of which is a modified S curve or a type of paisley design in white and heightened with them red designs. At the end of each counterbalancing S curve is a series of concentric circles or spirals. Between the S curve designs on the vase are horizontal oval forms punctuated with them red and white oval forms which are reminiscent of some plant life. Underneath this design are a series of triangular forms in white with other forms or dashes punctuating them. 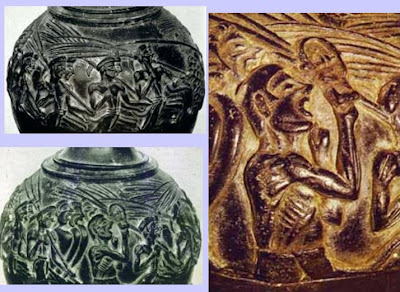 The designs tend to be more geometric in their stylization while other periods and other regions vases are more naturalistic. The colors of the Kameres Ware ceramics tend to be slightly more saturated and primary than other places and incorporate reds, whites, and blacks. 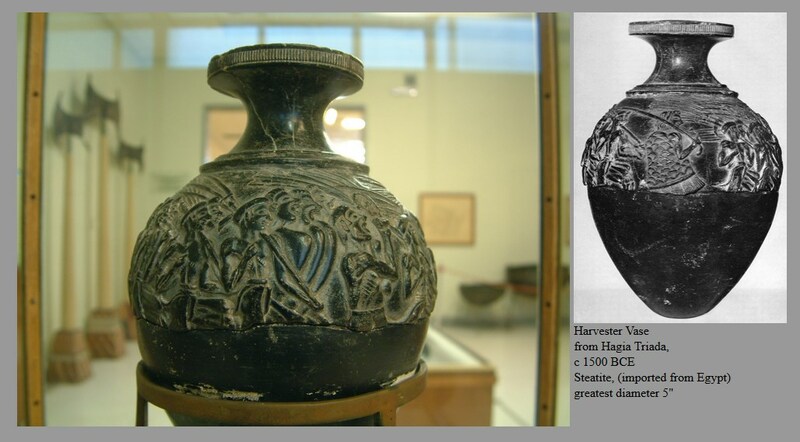 It is hard to separate the context of what we know about Knossos from the interpretation of the images on these vases. However, if we were to put this vase in the context of many other vases from this time, then it might be easier to draw some conclusions. The vases below are all from a Museum in Crete dedicated to Minoan art. All the vases in one case are classified as Kameres Ware vases. By looking at all of them in context and comparison to one another we can start to make the judgment that they share in style. And we get use to the stylistic conventions of how things are portrayed and in this way we can start to decode what is portrayed here. The things that are most recognizable are flowers and fish. A sort of subset of that are patterns that look like leaves and other botanicals. So we now have a cross reference of symbols or images. 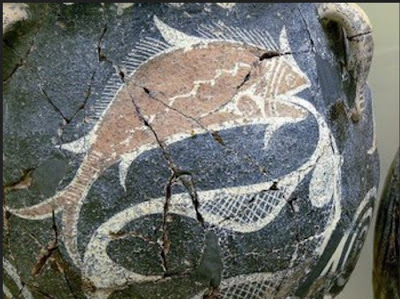 And if we return to the of original vase we can see that it shares in some of the themes and in doing so we can see that it is possible to assume that these are some sort of water plants and by extension possibly, probably not, the S-shaped form might stand for a seahorse. Although abstract we now have a sort of cross-section of the things that are at least depicted on Kameres Ware. If we were to combine are sort of iconographic database of imagery we looked at so far and think about the subject matters we have in them, dolphins, other sea animals, mythical beasts, depictions of bull vaulting, and will also see fishermen, and even boys boxing. Something across all of these is often the depiction of some kind of landscape or plants. It also seems that some of the iconography or the subject matter of some of the paintings jumps from object such as a wall painting, to a painting on the vase, to even small figurines. The commonality between all of them is that they describe a picture of the things that Minoans thought about. And in some instances, Minoans are very specific about the kinds of decorations that they’ll put on certain objects. So far, in most of the artwork that I’ve looked at, vases only depict plant forms, fish, and semiabstract patterns that depict plant forms and fish. A comparison of these two clay pots, which are from different regions, and are in two different Minoan styles, tells us that there is a commonality in the iconography of all Minoans at least on the pottery. 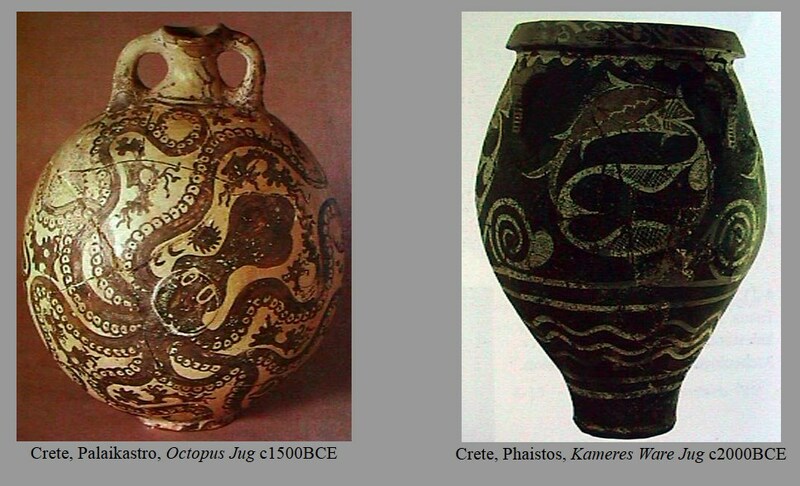 There is a subset of popular vases from the Minoan culture that depict octopi. And in terms of formal analysis these vases are very different from the Kameres Ware. However, they do have some stylistic similarities and also similarity or at least relationship to Kameres Ware, in that they represent an animal that comes from the sea. The symbol of the bull is now familiar to us. We have some reasonable theories about what it may have symbolized in the Minoan culture. 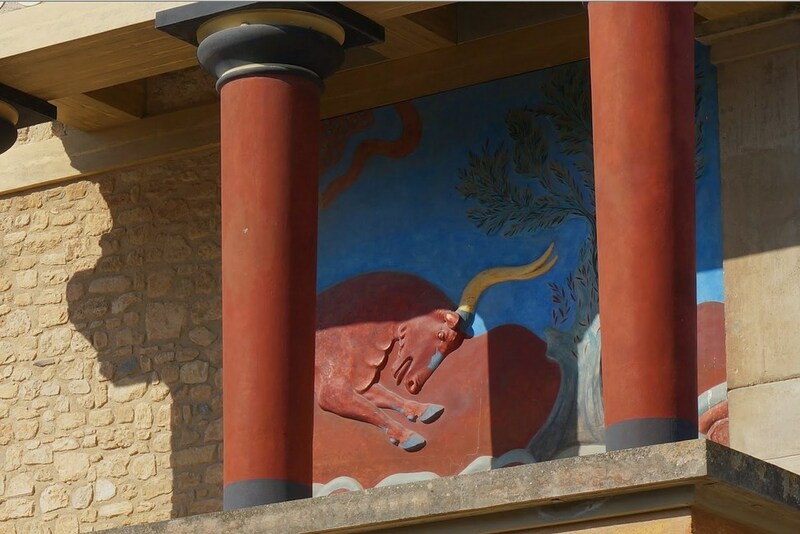 In Knossos it seems reasonable to assume that bulls represent some sort of power. At the very least they were a source of entertainment similar to today’s rodeos and or bullfights. We have rituals or celebrations in which people jump over the back of bulls. Now, we see an enormous hollow carved stone object that is in the shape of a bull. There have been 23 of these objects found throughout the Minoan world and on Knossos. At least 11 of these objects that were made from a variety of materials have been found on the island of Crete. The commonality that all of these bull shaped heads have is that they are in the shape of a bull, all of them are hollow, and have some sort of passageway from the hollowed neck to the nostrils or mouth. Scholars really don’t know what they were used for and there are variety of reasons that support interpretations of what they mean and what they were used. The example that we’re looking at is just one of 23 examples. It is the most well-known because it is the most well preserved and found by Evans. 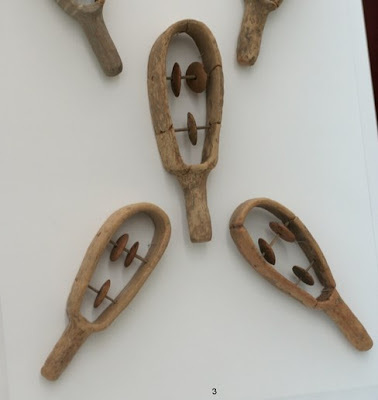 Of these objects found on Crete, there were several found also in Mycenae, none of them were found in an area believed to be used for religion, for example a meeting room, nor were any found in what is deemed as the Palace area by archaeologists. Most seem to been found in private homes. At Crete none were found in tombs. Almost all of them have been broken and some were found incomplete in most instances. So the context in which these objects were found doesn’t let us necessarily believe that they were used for ritual purposes and they also weren’t found in tombs. This creates problems of theories in which people want to believe that these heads represented sacrificial bulls. Many scholars have made the argument that these heads were a type of pitcher used to poor libations. A libation is a type of liquid that would be used to celebrate or for religious purpose. For example, most cultures use wine as a libation especially in the Judeo-Christian tradition. There are problems with the actual use of these heads as drink dispensers. They are just too heavy and awkward and historians have made some fake ones and tried it and it just would not be done because it would be too hard. It doesn’t seem logical think that this object was used for out liquid in some sort of religious ceremony. Nevertheless, many historians have tried to theorize that it would be used to poor a sacrificial liquid such as wine and some scholars more romantically have tried to suggest that blood of previously sacrificed bulls was stored in the neck and then poured through the nose or mouth, the finger of the user used as a stopper. The conclusion that we need to draw from all of these theories about its interpretation is obviously we don’t have enough data interpret or figure out how these things were used let alone what they were used for and what they symbolize. But we need to do is look at the object as a primary document. If we look just at the facts that we have, what this thing was made from, how big it is, what it represents and how it represents this animal we might be able to use these facts combined with actual contextual facts really draw conclusion that makes sense. 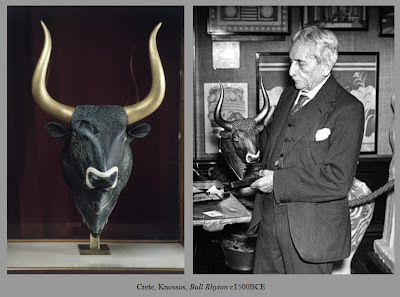 The next step then would be to do an exhaustive formal analysis and see how the form might influence how ancient Minoans thought about the bull. This Bullhead is carved from a type of soapstone called black steatite. Some sources have suggested that is imported soapstone from Egypt. Do more research if you’re going to use this as a point of evidence in a paper. 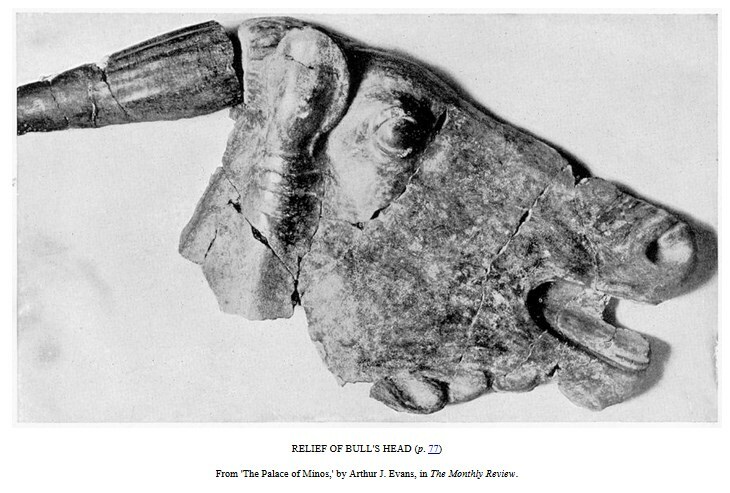 The head the bull created by carving a single block of soapstone and hollowing it out from the reverse. In this case it has a backplate made out of the same soapstone and beveled close join with the head. There were dowels that were used to hold it together and most likely glued. Ignore the horns, Evans put them on as a replacement and we have no idea what they were made out of originally or how long or short they were. There is a hole that connects the hollow in the skull to the nostrils the front. The skin or texture of the hair of the bull is incised into the surfaces. Other precious minerals such as gold and rock crystal were used to complete the rest of the features. The high relief aspects of the bull, the anatomy, the shape of the head for example are all very realistic. The incise lines that represent the fur and/or texture and direction of the hair are slightly more stylized however the overall sense of this is that it is very realistic. 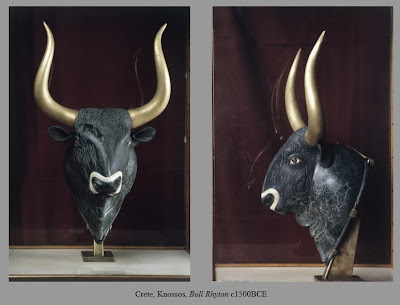 Moving beyond a rudimentary understanding of what bulls represented in Knossos it might be safe to assume that bulls were at least popular if not a symbol somehow of some of things that the people from Knossos believed. We find it in many places and we also see fairly many representations of people controlling bulls. We even see this in a cup from the Mycenaean mainland that is called the Vaphio Cup. That is all we can say with certainty. There are other things or reasons we can speculate on why and how this object might have functioned in the Minoan world. The safest most rudimentary story is probably the most reasonable. This is a fancy prestige object. It could have a simple a use as this is a decorative expensive object that expresses something about the person who owned it. It might be even something as simple as a portrait of one of the famous bulls from one of the bull vaulting events. 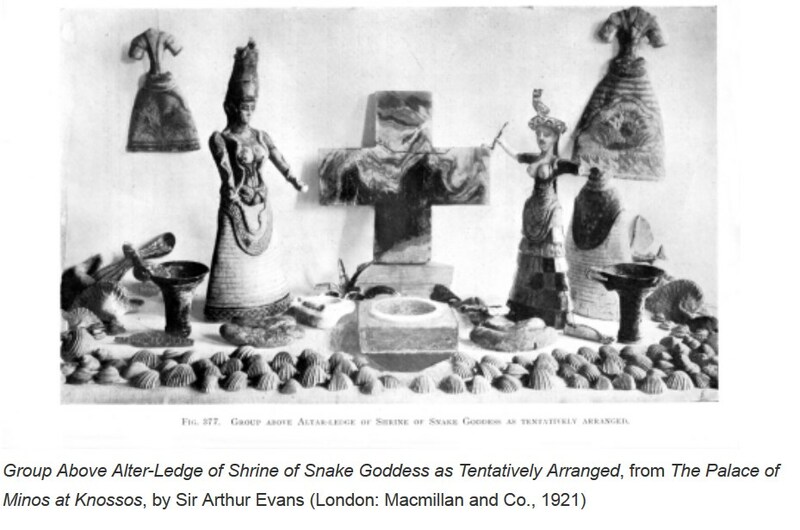 The circumstances under which these were found does not really suggest that the title of Snake Goddess is fitting for the sculptures. 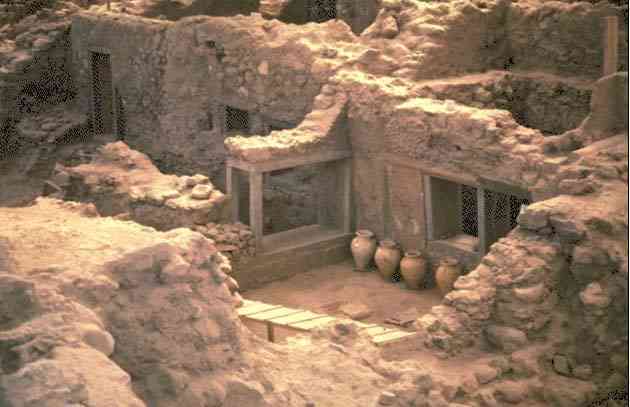 They were found underneath the floor of a passageway or room in Knossos however they were broken into several parts. When Arthur Evans found these sculptures he had them reassembled and he also designed and altar and placed objects on. He accompanied the two most complete sculptures with other items he found nearby in an attempt to re-create what he thought the altar should look like. Here’s a photograph of it. 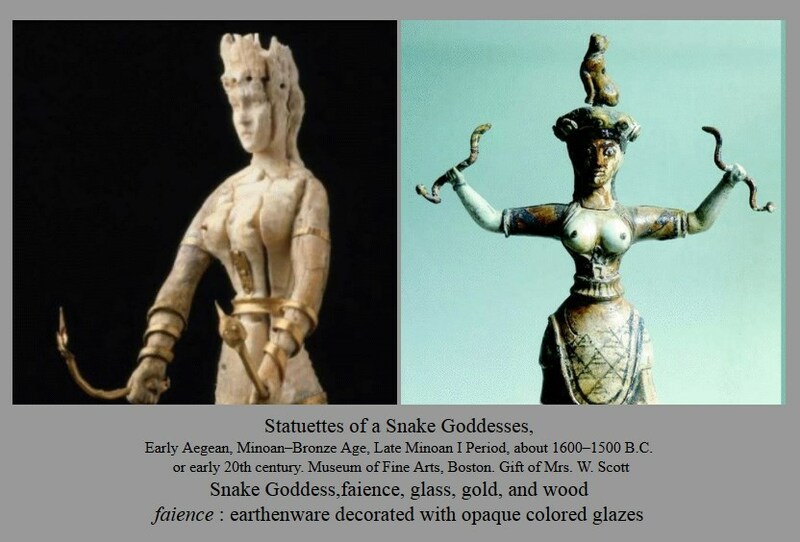 There are other images of females from Crete and Knossos that depicts women wearing the same kinds of costumes however, to my knowledge, there are not any other depictions of women holding snakes aside from these sculptures. 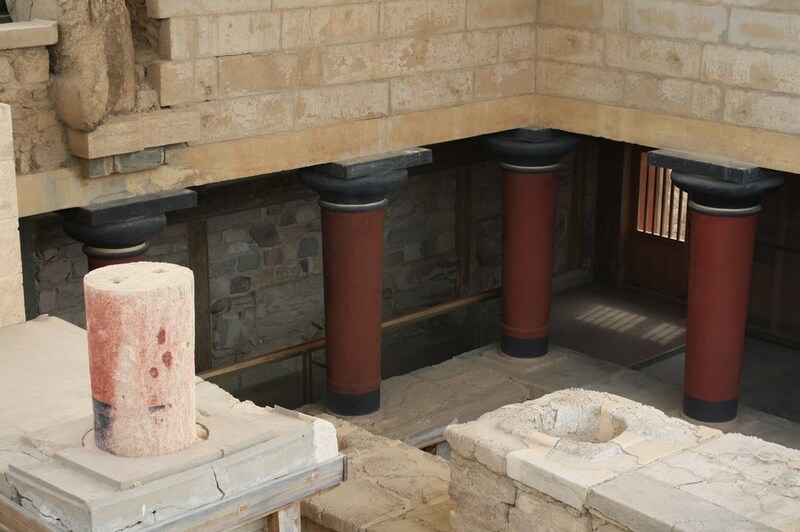 The sculptures were found purposefully broken and buried underneath the floor of one of the rooms at Knossos. The circumstances, of sculptures being ritually broken, and then buried might’ve happened several times at Knossos. For example the circumstances under which the bull headed sculptures were found indicates that that times they might have been buried on purpose. 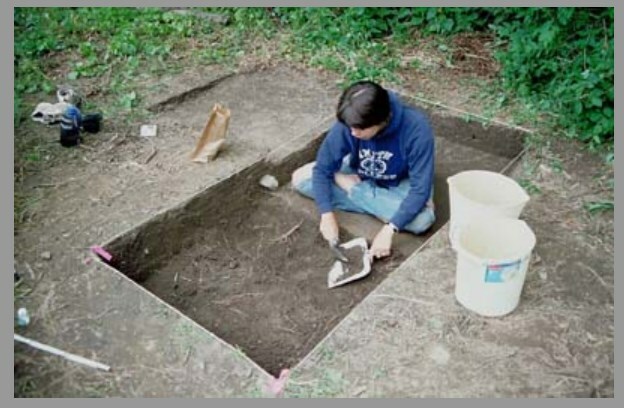 In many cultures, the Maya, and the later classical Greek’s, all have a ritual in which they bury or destroy religious items that they no longer want. This is also true about the Anasazi people of the Southwest United States. There are entire graveyards of ritually destroyed pottery. The Navajo, explain that their ancestors the Anasazi, did this to send these items to the afterlife so that dead people could use them. In the case of the archaic Greek’s around 600 BCE, they would do something similar, in which they would bury gifts to the temple behind the temple when they were no longer used. As in the bull headed sculpture, it’s probably best to use a primary formal analysis of the objects to help us in making interpretation of what these figurines represent. The two that were focusing on here were made with a substance called faience. It’s basically a type of clay and vitreous clay and glazes that are used to colorize the pieces. It’s a highly refined form of engobe. The colors that are used, also include gold, and some primary and secondary colors of orange with some blues and greens. 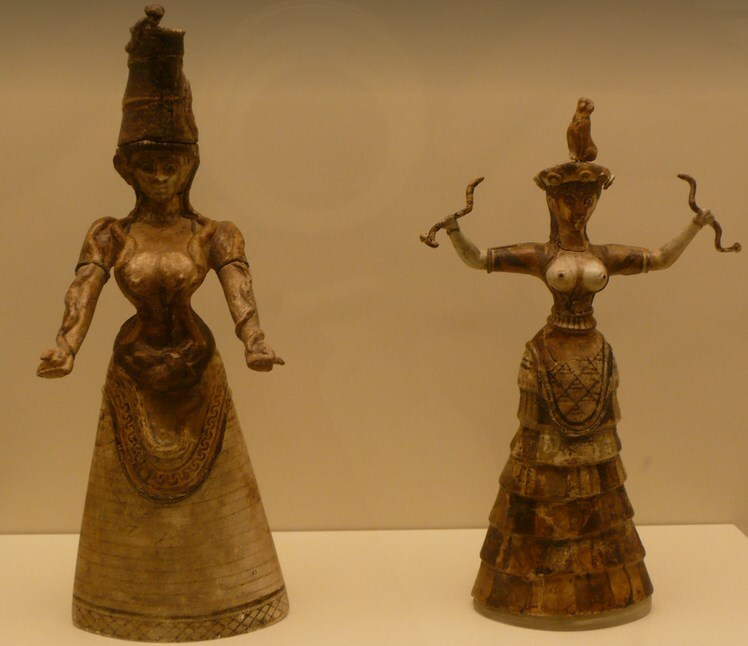 The figurines both represent bare breasted female figures wearing costume that covers part of their arms and also some sort of skirt or dress. Underneath the dresses the legs hang dangling almost like clappers in a bell. The figure on the left has a more simple gown and has snakes in twined around her arms. She also wears some sort of headdress that is almost comical. The figurine on the right, which is the more famous one, is wearing a sort of patchwork pattern on her dress that is similar to the border pattern that you find in the Bull Jumping Fresco in the so-called Queen’s throne room. This figure has raised arms and in each hand she is clasping snake. On her head is a headdress surmounted by some sort of catlike creature. The eyes and features of each of the figures are fairly naturalistic however, there are traces of the type of makeup, including lipstick and eyeliner, that we see in other depictions of females in the frescoes around Knossos. The eyes are heavily outlined in a way that’s reminiscent of the makeup that we saw from Mesopotamia and Egypt. There is a bit of stylization in how the nose looks which is similar with some of the stylization that we saw from Mesopotamia. There is no written documentation in any of the Linear B texts nor do we have any clues beyond the similarity to the representations of females in the frescoes, and other figurines. Therefore, reading it in a literal way first and naming the icons might be the way to begin. 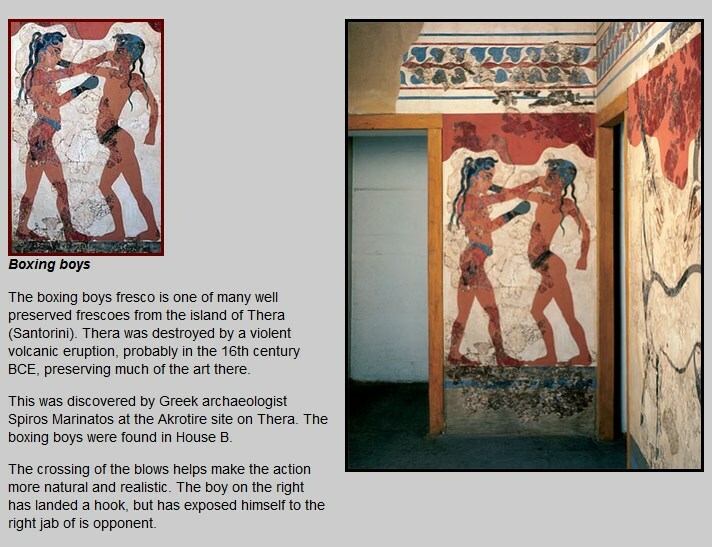 There are other images throughout Knossos that suggest that some women when about bare breasted. 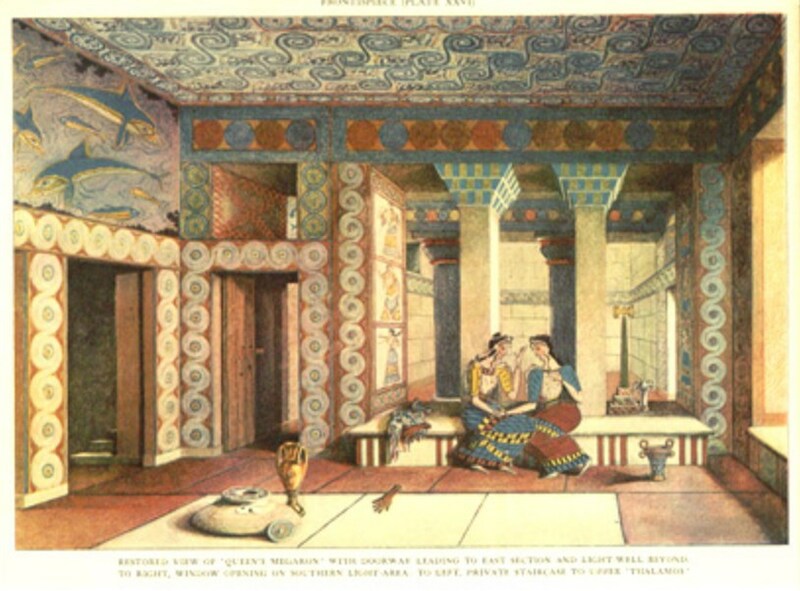 There are also similar representations of females around Knossos which is a Palace not a temple. The identity of these women, as the identity of the bull jumpers, is unclear. In the same way that were unable to tell whether or not the figures from the bull jumping fresco are enacting a religious ritual or sporting event we can’t really know who these figures are. The popular explanation is that they are goddesses. Since we don’t have clear representations of who the gods and goddesses were in any of the temples throughout Knossos but we do have representations of the people who lived there, it might be safe to assume that these are actually representations of people from Knossos and not necessarily a goddess. 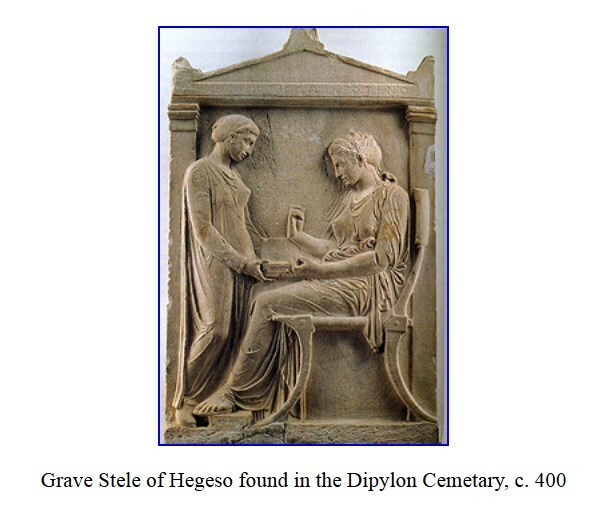 The best theory that I found is that these figures represent priestesses rather than goddesses. 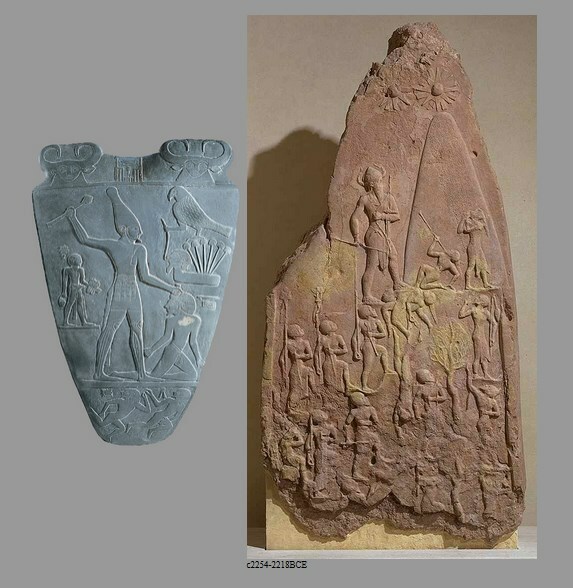 If we look back at the function of small figures and sculptures from Mesopotamia and from Egypt most of the representations of freestanding figures, especially at this size, represent either votive figures or facsimiles of people in their tombs. Sometimes they are commemorative portraits. There are several clear choices of animals, and costume, that have parallels in ancient Egypt and possibly other cultures. For example, the regalia and the expense of the objects, even the materials that there made out of, represent some sort of wealth. In Mesopotamian Egypt kilt like costumes with extra ornamentation often indicated status or where that person was from. Snake imagery is a big part of Egyptian iconography and is often conflated with aristocracy. Many of the gods and goddesses use different kinds of snakes is symbols. There is no indication through Egyptian iconography or Mesopotamian that snakes mean the same thing for them as they do in the Judeo-Christian system of of symbols. In fact, snakes more often represent regeneration rebirth, as well as gods and goddesses in the Mesopotamian and Egyptian world than they do anything negative. There is of course, also a Freudian interpretation of this, check your psychology textbook. Felines and/or cats are also symbols that we have encountered in the Neolithic culture of Asia Minor, Egypt, and even at Knossos where we saw a part lion creature in what Sir Arthur Evans dubbed as the King’s Megaron. 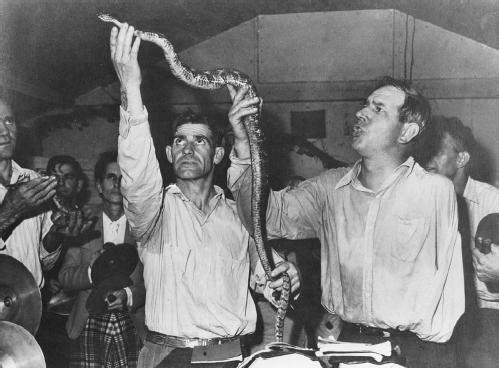 One of my professors suggested that the snakes and the control of snakes is similar to the southern Christian practice of snake handling during religious services. He pointed out that one of the women is holding snakes in a similar way to some of the religious leaders from that cult. These religious fanatics believe that God will protect them from the snakebite if their heart is pure. It doesn’t always work. If you Google it you’ll see that there are at least three deaths in the last 10 years from this. My theory is that these are some sort of priestesses, or votive figures representing priestesses, that were no longer needed and were ritually put in some sort of grave. 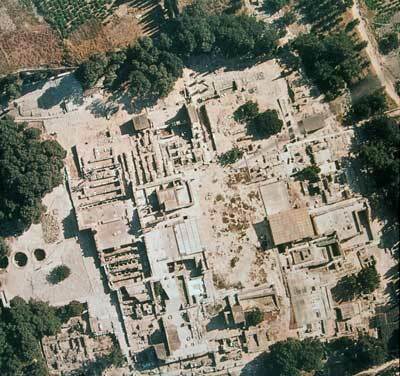 There are many theories about the destruction of the palace of Knossos. Some of the theories that are incorrect, or at least unreasonable to believe, are the following.. Scholars used to argue that there was a cataclysm that ended the culture at Knossos and made way for the next major temple. After 1500 BCE. 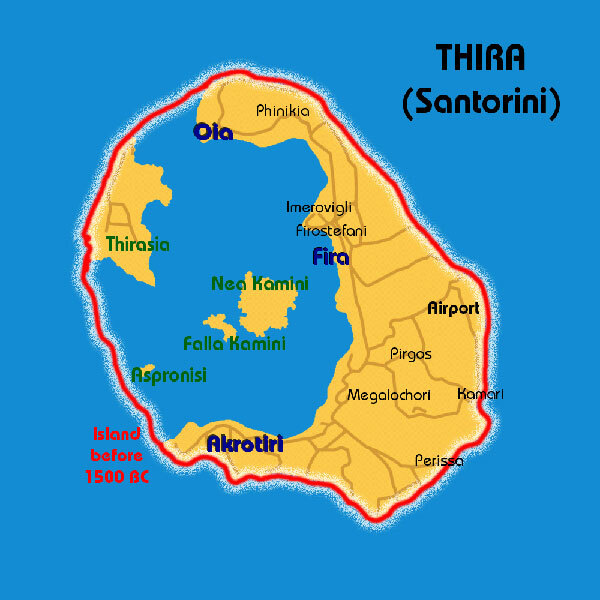 There is evidence of an eruption on an island nearby called Thera. It also is seems that there was a series of earthquakes on the main island of Crete which happen right around the same time. These are facts, however, some of the historians have tried to say that Thera or Knossos is the lost island of Atlantis. Other historians giant tsunami waves were generated by the eruption on the island. Some sketchy analyses of some of the rocks and boulders on the island cursorily supported these theories. Most of these theories seem a little bit to romantic and dramatic. Here is the most reasonable theory that I’ve been able to formulate from the facts concerning events that happened around 1450 BCE on both the island of Thera and Santorini as well is some surrounding islands that were thought to be part of the Empire of Knossos. 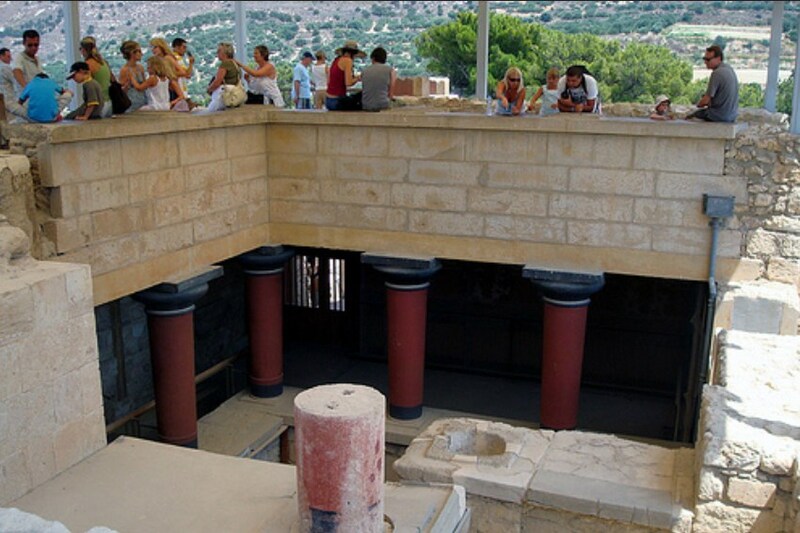 Several facts are, there were a series of cataclysmic earthquakes on Knossos at several times during this century. 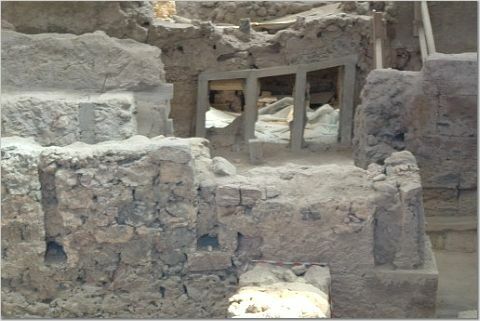 Thera erupted and reform the island however immediately thereafter it seems as if houses were rebuilt there. 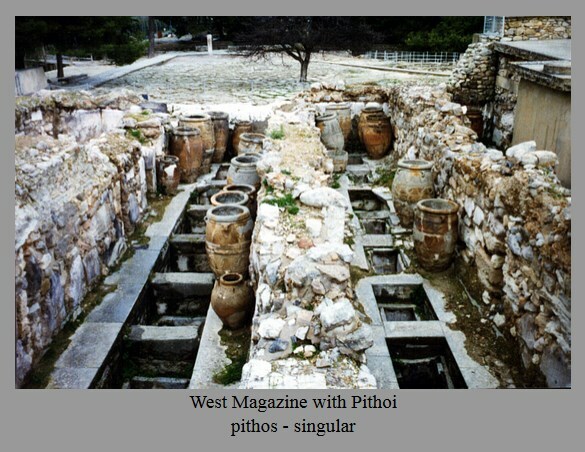 There were a series of deliberate fires set throughout Thera and Crete, as well as other places, that seem to have been set on purpose and burnt up things like storage spaces that had olive oil and other foods put away. 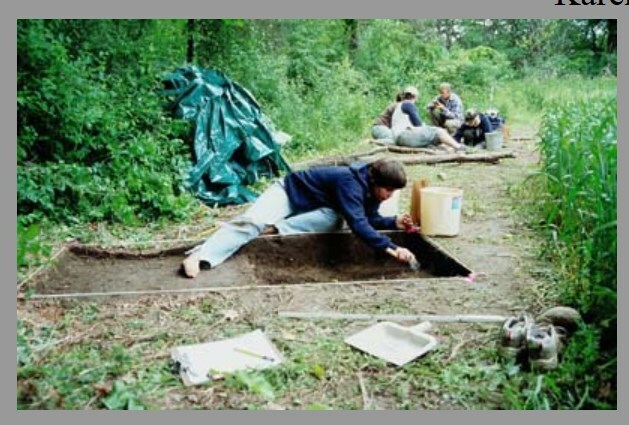 There is evidence in two places that support that there were some unusual ritualized human sacrifices that happened at the same time as the volcanic eruptions happened and the burnings. In fact, evidence of one such ritual sacrifice, seems to been interrupted right at the moment of a sacrifice because forensic evidence shows what is undoubtedly a scene of two people being sacrificed and their blood being carried away for some ritual. With the above facts in place, what’s been reconstructed by some archaeologists and historians seems to be a time of disasters for the Minoan people..
Here’s the scenario, which is a theory of what might have been historical events, around 1450 BCE. 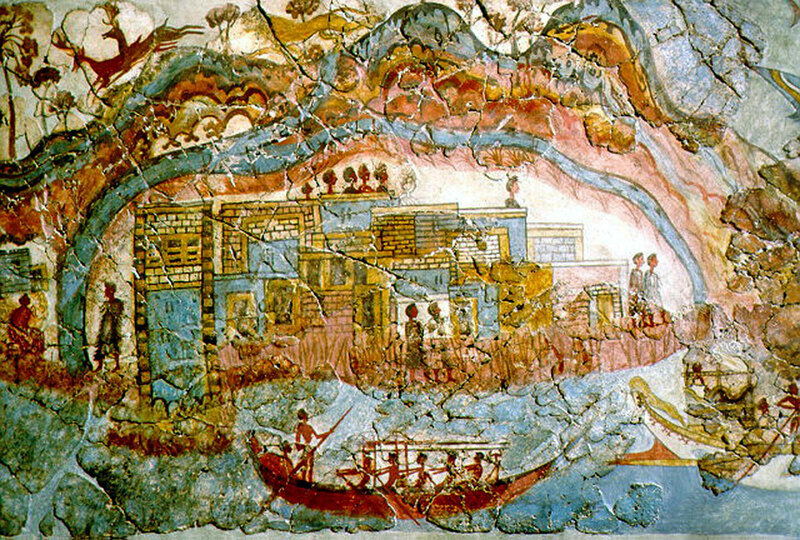 The natural disasters and eruptions that happened may have undermined the Minoans belief that they were entitled to the good life that they had. 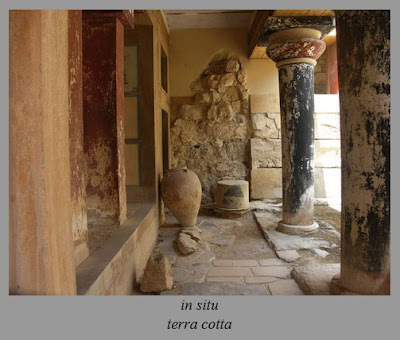 Before the eruptions and earthquakes the storehouses of Knossos were packed full of surplus food and wealth. 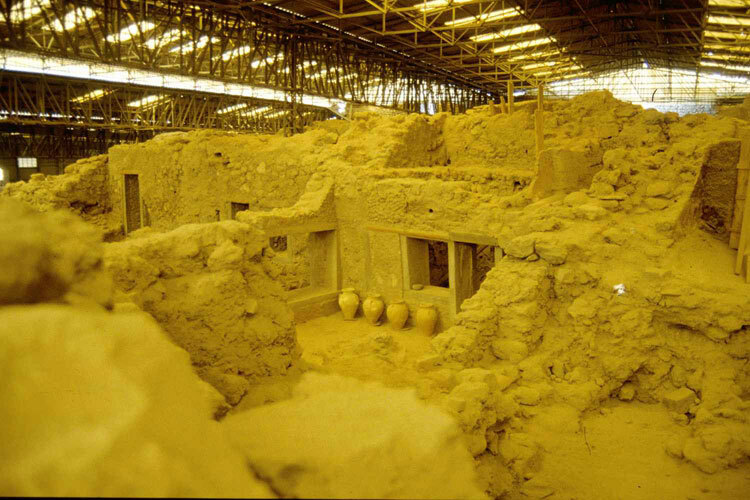 After the earthquakes it seems as if some of the granaries and storehouses were deliberately burnt to the ground. There was also, the destruction of the temple in which a cult figure of a kouros figure was deliberately destroyed and the temple set on fire. The historians who’ve looked at this suggest that the Minoans might have been repenting or punishing themselves for having such wealth and thought that this was the gods delivering judgment on them. This relate somewhat to the idea of hubris that we see in the stories concerning King Minos and the Minotaur. The next set of historical facts surround the idea of a found language. When Evans excavated the site at Knossos he discovered clay tablets that contained something that looked a little bit like cuneiform from Mesopotamia. He found two groups of tiles that seemed as if they had completely different languages on them. One set of tiles, he dubbed Linear A. The other, language he found, is called Linear B. Historians have still not been able to decipher the first language however, Linear B has been linked and deciphered since 1970, to the early Greek language and alphabet used by the Mycenaeans. 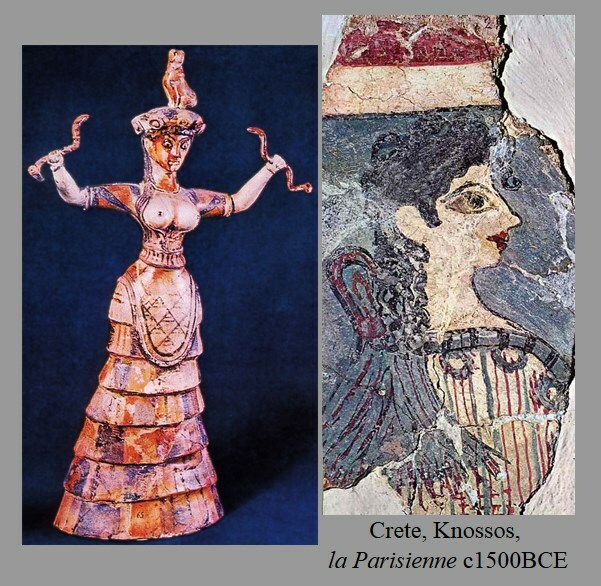 The theory suggested to historians by the natural disasters and the discovery of a mainland language at Knossos is that the Mycenaeans took over Crete and its Empire after the series of natural disasters undermined the Minoan civilization and Empire weakening it. Although there is evidence of both Crete and Thera being rebuilt after the natural disasters, there are several sites on the island that predate the cataclysms. Akrotiri is a major city that had some really nice frescoes. In fact the island has several that will be looking at. Here are the remains of a community from that island. You can see that they lived very similar lives to the island of Crete. The architecture is a little less fancy doesn’t seem to contain as many fancy elements such as columns but the way of life seems very similar. 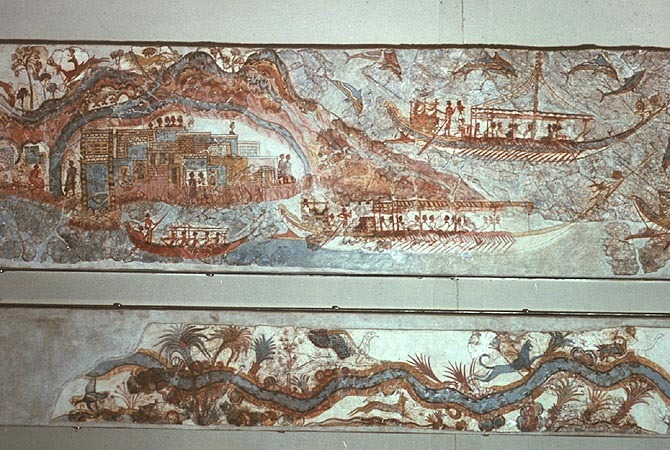 The frescoes from Akrotiri and Thera describe a life that looks pretty much what historians envision at Crete and throughout the Minoan Empire. This fresco is several yards wide. It is almost similar in form to a rolling scroll that you might find from China. In fact it has a lot of things in common with one scroll we’ve already studied from the Book of the Dead. It represents a flat diagrammatic depiction, almost cartoonlike, of the landscape of several cretin islands and the ships that are sailing on the sea. There is no shading, at least the figures cast no shadows. 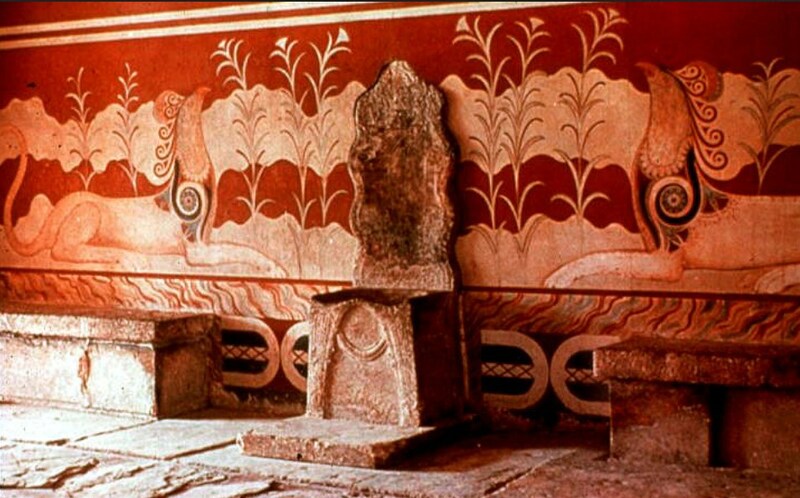 The colors are very similar to the colors used in the Bull Jumping fresco found at Knossos and the style of depicting the bodies and buildings is very similar to the frescoes that we see on the mainland. All forms seem to be outlined or have contour lines around them. Many of the vegetal and botanical forms as well as depictions of the sea creatures use counterbalancing curves and bright colors. 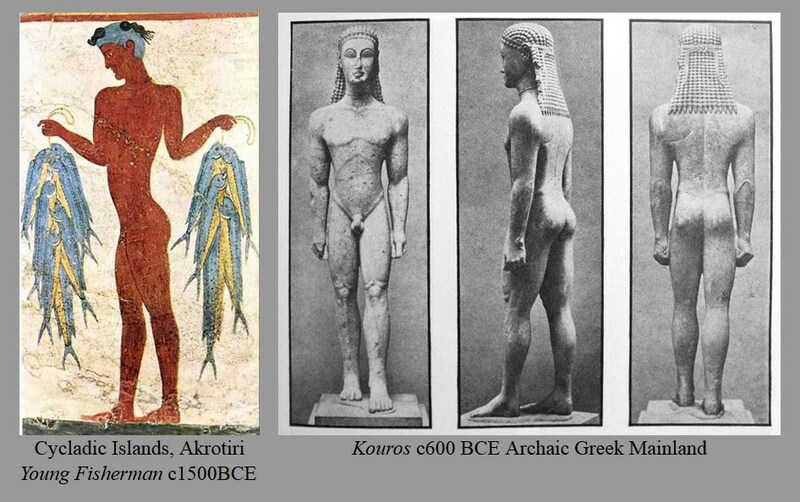 Human beings are portrayed in a manner consistent with the main island, they are thin waisted with broad shoulders and depicts them wearing very similar clothing to the frescoes at Knossos. Everything is stylized in a Minoan way. This will be true for all of the frescoes found on the island of Thera. Probably what’s the most important thing about this fresco is that it depicts the lifestyle of the people from the island of Thera. And by extension it depicts all of the Minoan culture. Historians describe it as symbolizing a harmonious pleasant life, where food is plentiful, and there is a great deal of trade. 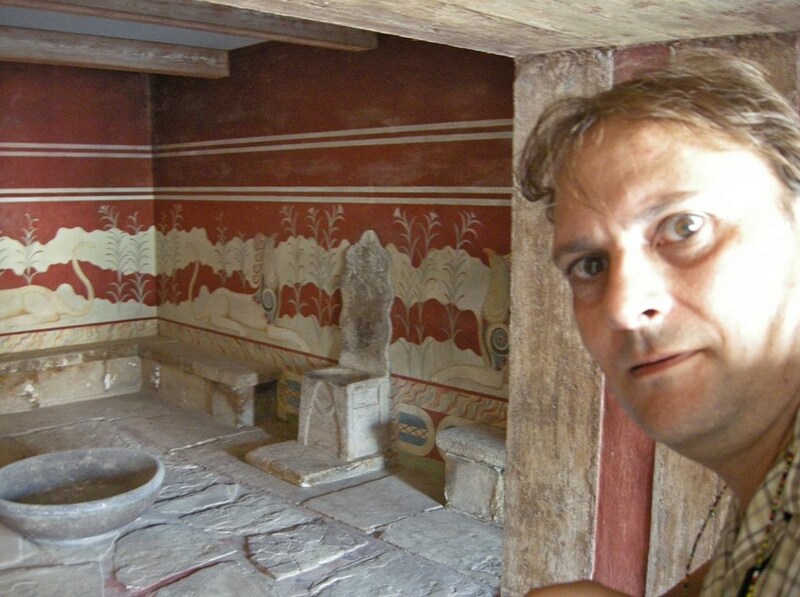 Probably even more important, is the fact that most historians use frescoes from Knossos and Thera as a way of comparing them to the more violent and warlike themes that appear on the mainland at Mycenae. Most scholars use this work as a point of evidence to show that the Minoan culture was a more hedonistic and wealthy culture than the people from Mycenae who constantly had to fight off invaders. To further the argument, it’s been pointed out that the Minoans had a Navy patrolling the seas and therefore were inherently more confident than the Mycenaeans. Overall, all of the following works share the same formal qualities as well as iconographic qualities since they were found in the same context they further the thesis that the Minoan culture was a pleasurable one. For example, wealth and plenty as well as showing an idealistic world is demonstrated in this fresco of a young fisherman. He obviously is holding a bounty of wealth and he himself is a beautiful example of a muscular young man. This idea, of depicting beautiful young men and women seems transcendent to the Mycenaeans, Minoans, and then the classic Greek and Roman to follow them. Beautiful young people are thought to represent ideal citizens. We can see this in these two other frescoes from Thera. On the left-hand side you can see two boys with idealized body types boxing. The idea that there boxing rather than wearing armor and showing a scene of battle like we would see in Mycenae could support the theory that Minoans were not really interested in warlike themes and that their culture was in fact less warlike. Boxing is a sport that is often used as a type of exhibition sport, is this what the bull jumping theme was on the mainland? In Mycenaean art when they show warlike themes or some sort of battle going on people are wearing armor. Both cultures share hunting scenes and also scenes of animals that they value as we can see from this antelope on the right-hand side. The “Spring Landscape” is a fairly flat linear depiction of plants, soil, and birds found on the island. Again consistent with the other frescoes we looked at our bright colors counterbalancing curves and outlines. The birds are almost cartoons composed of simple dark outlines that are almost like calligraphy with the brush. The space that’s being created is actually shallow. We have are these plants and rocks pushed up against the for ground of the fresco. Even the birds do not seem to be flying far in the background. The subject matter of many of the frescoes from the Minoan culture are markedly different from any of the other cultures that we’ve studied so far. If you were to look at some of the things that we’ve looked at before, prehistoric wall paintings are usually of bisons and game animals. They might be religious but they still represent animals and sometimes people trying to hunt the animals. The supposition is that prehistoric cave paintings of bison and human hands etc. were put there for religious purposes. In fact, most of the wall paintings and plaques we’ve looked at from Egypt and Mesopotamia represent either political leaders or were used for religious purposes. In the Minoan world it’s the first time we are encountering paintings that look like they might just be about common everyday life. The closest we’ve come to this is the work of Akhenaton and even in his it represents him as a political leader.